After Lisbon, we only had two full days in Barcelona. Both days, the weather report said it would be stormy and rainy, but the first day it was just a bit overcast. 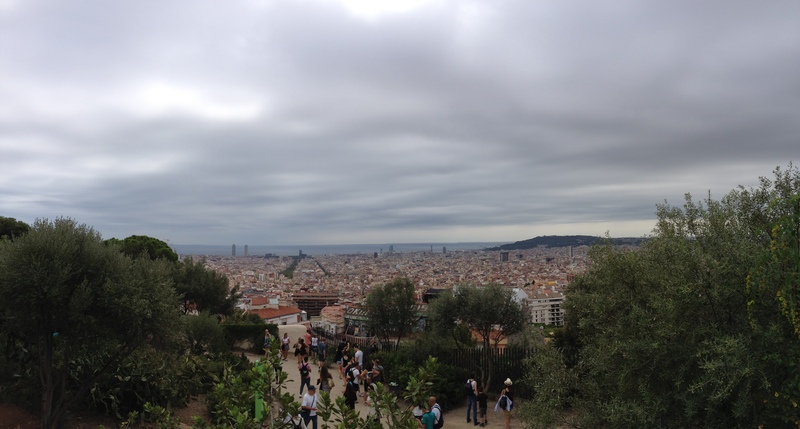 We spent that day checking out Park Güell – there is a nice uphill walks, views of the city, weird musicians, and the Gaudi House Museum. Gaudi lived there from 1906-1925, a prolific work period for him. I appreciate that he (or his family I suppose) left the house to the city of Barcelona after his death so that the public could have a view into one of his living spaces, especially since there is a public park surrounding it. 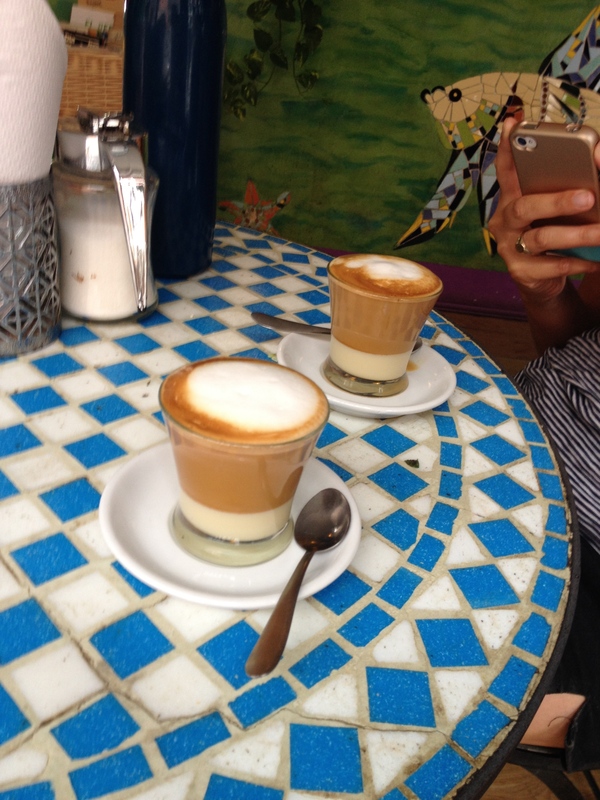 On the way to this park, we randomly stopped off at a cute little cafe, where we discovered a new coffee drink – cafe bonbon! It’s an easy recipe: in a small glass, make a thick layer of sweetened condensed milk, add an espresso shot and pour steamed milk to the brim, finishing with a dollop of foam. One day I will have an espresso machine chez moi; until then, I make it using normal drip coffee and it’s still delicious. Based on some random coffee definition pages on the internet, it seems like cafe bonbon is traditionally just the condensed milk and espresso, so I guess Maigot Cafe embellished the recipe a little bit, a good thing in my opinion! Because of the false alarm regarding the storm on our first day, we decided to go out dancing that night and recuperate on the beach the next day. Only half of that plan worked – I’ll write about the dancing in another post. However, the beach plan was FOILED the next day by a torrential downpour. Wearing our shorts and sandals, beach bags in tow, we were headed back to the hot dog place we’d eaten at the day before (post to come), and of course it started to pour rain right when we reached a wide open plaza with nothing to run under. Eventually we got to a little street with overhangs, and when we made it to the hot dog place it was closed. So instead of going to the beach, we wandered around the area near the hot dog place and did some shopping. I discovered a new line of shoes that I loved and I ended up buying a pair. When I was young I used to love buying random things like shot glasses and spoons from places I traveled to, but now I like to buy clothes and shoes. Then I actually get use out of the items and think of my trips every time I wear them! It was a total bummer that we couldn’t get to the beach, as we had only gone there one time in Lisbon. But we made the best of it and still had a lovely trip. Note to self: never listen to French people when discussing the cuisines of other countries. 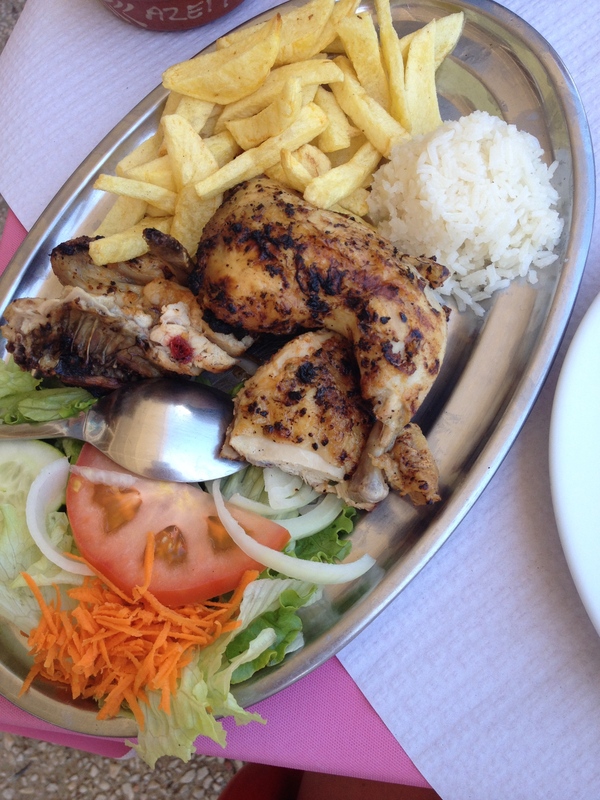 Everyone I spoke to before going to Portugal told me the food was bland, that it was a meat-centric cuisine and that they were incapable of cooking it nicely. This made me worried for Ottilia (vegetarian). But we were surprised and delighted by the number of vegetarian restaurants we saw while strolling around. 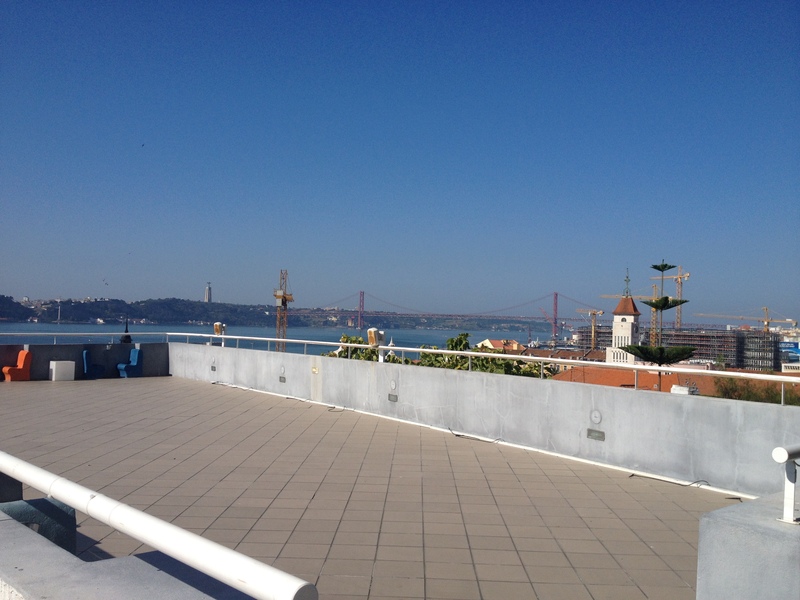 Sometimes it felt like we were in San Francisco, not Portugal! Many places seemed to be very French-influenced or otherwise global. While exploring one day, we took note of one place, Planeta Bio, that looked nicer, and returned there on our last night in Lisbon. At 8pm, we were the only diners! (Later on, we walked by and noticed that it was packed and there was now a wait. It’s such a late-night city!) There were only 4 options on the menu, and you chose small or big and 2 or 3 dishes. That’s it. Between the two of us we tried everything! There was moussaka, leek lasagna, leek gratin, and seitan korma. 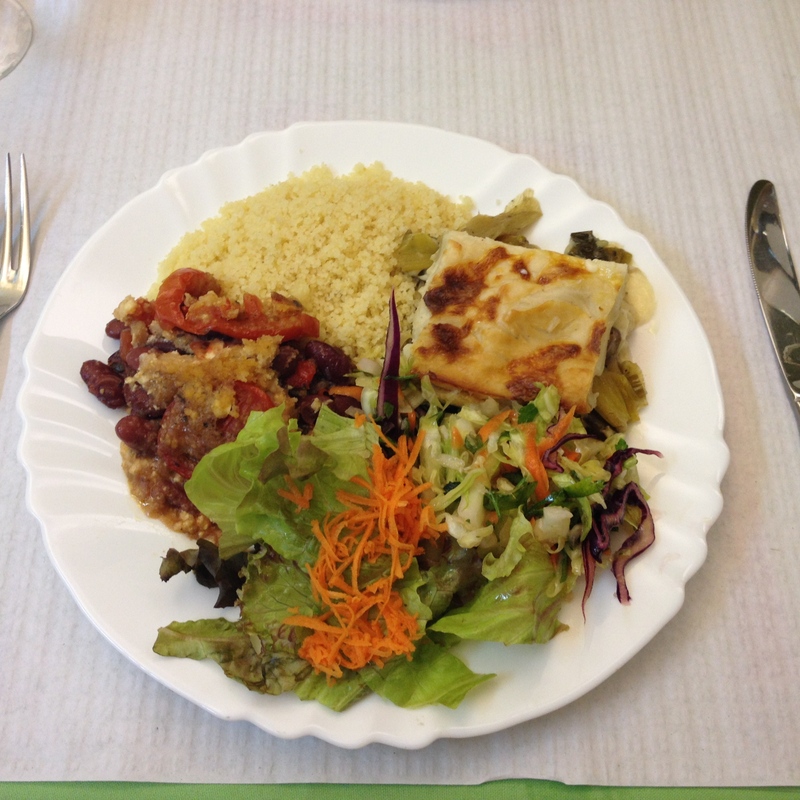 It came with a delicious, fresh salad and a choice of couscous or brown rice. Our only complaint was that it was not spicy enough. I suppose we could have asked for some sauce or something…anyways, it’s so nice to get healthy food like this while on vacation! One day we did a walking tour to learn a little bit about Lisbon, and afterwards we strolled around the winding cobblestone streets in the older part of town. I saw a sign for 1€ wine so of course I had to stop. We ended up stopping for a small glass of the green wine typical of Portugal and fell in love with the charming, cave-like bar. 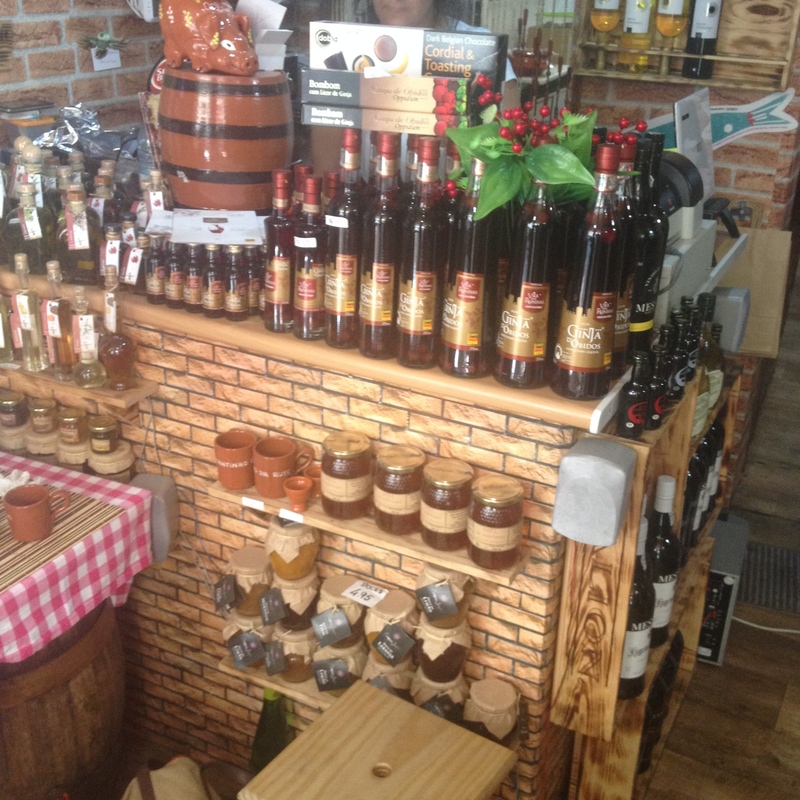 The woman who worked there was so nice, and there were plenty of lovely local liqueurs, sardines, honey, etc. that would make great gifts. 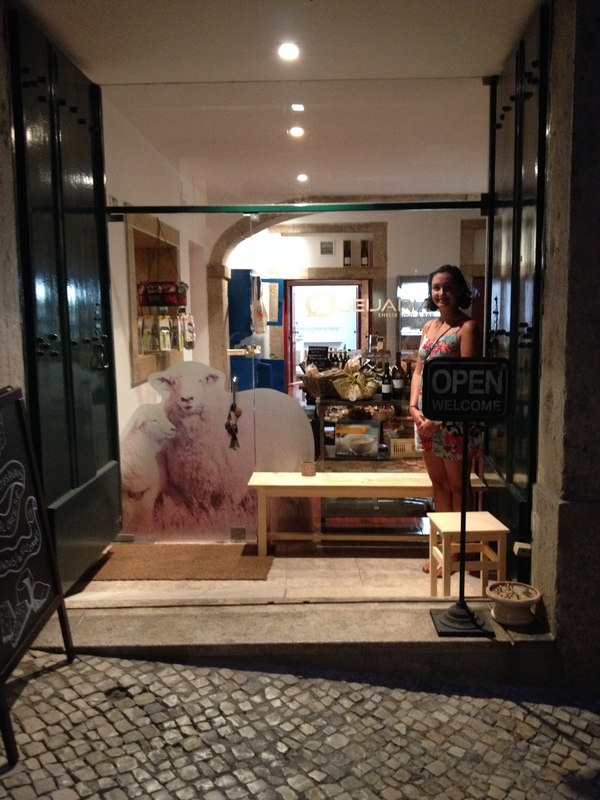 Another unique experience was checking out Enoteca Chafariz do Vinho, a nice little wine bar in a converted well-head/fountain space. It was a calm and romantic space, with sort of slow service but very nice people working. I have so much respect for waiters who have to walk up and down stairs, especially with tall bottles and delicate glasses! Anyways, I just really wanted to try some porto and they had several different types. We also got a chocolate mousse to share – it was more of a pot de crème or pudding than a mousse, but whatever the name it was chocolate-y and rich. Come here for very nice wine and a relaxing, chill ambiance – if I went back I would love to do the tasting menu! 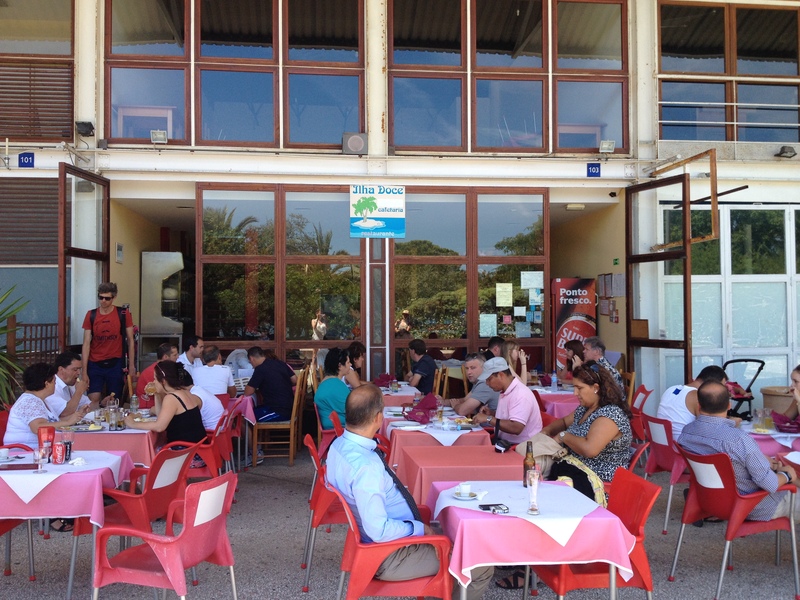 Switching gears to a more simple dining experience – we went to the modern area near the airport on the recommendation of someone from our hostel. This area was updated for the Expo ’98 and it looks quite different from all the cobblestone streets and tiled buildings found elsewhere in Lisbon. 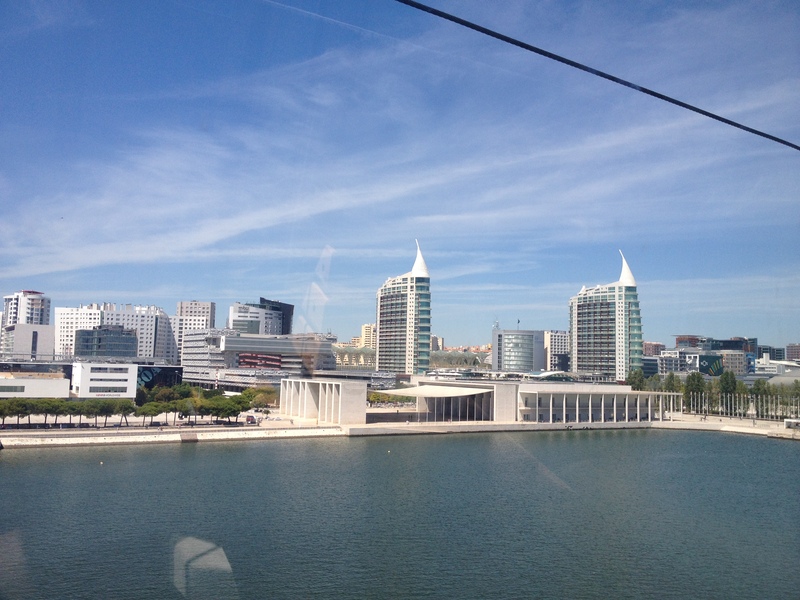 We rode the Telecabine and had a fun time checking out the view of the water, and when we got hungry we found an unassuming little restaurant that ended up being a great find! Unlike most other places we’d been to, not much English was spoken but we got by with hand gestures and saying a mix of Spanish and French words. Ottilia’s omelette was 4€ and my roast chicken was fabulous. Nearby diners were eating lots of different fish dishes that looked good for someone who loves seafood. I would 100% eat there again! 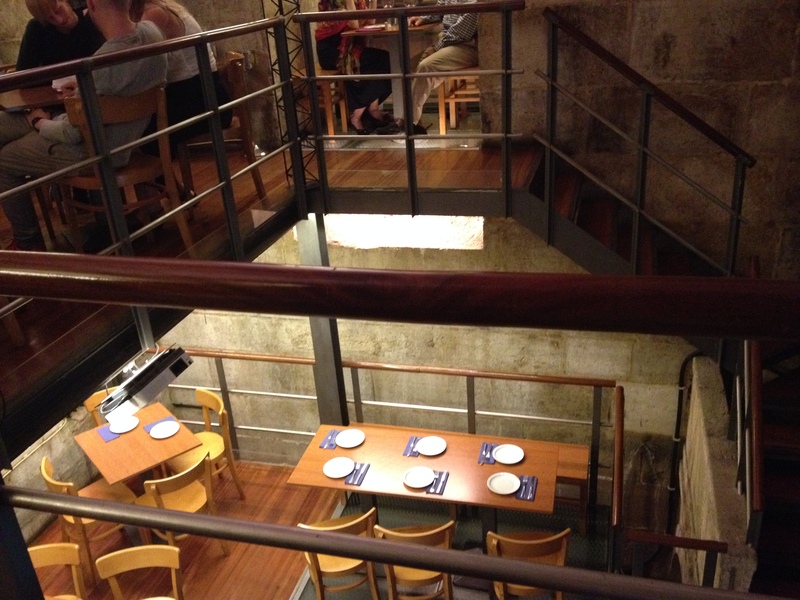 I can’t find the name of the restaurant, but from some sleuthing on Google maps I believe the address is 103 on the street parallel to Rua Bojador and the waterfront, right around the corner from the north entrance of the Telecabine. 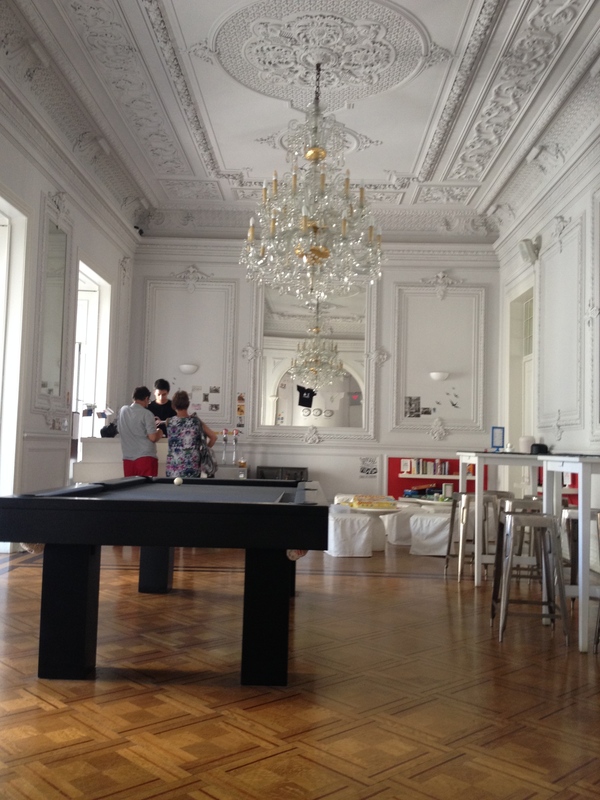 This is the nicest hostel I’ve ever stayed in. There was lots of common space, comfortable and clean rooms, and it was well-located being close to the water and lots of bars and restaurants and the metro. The building was very old, redone but with the original spirit preserved. It was charming but functioning. The computers and printing abilities were also handy. 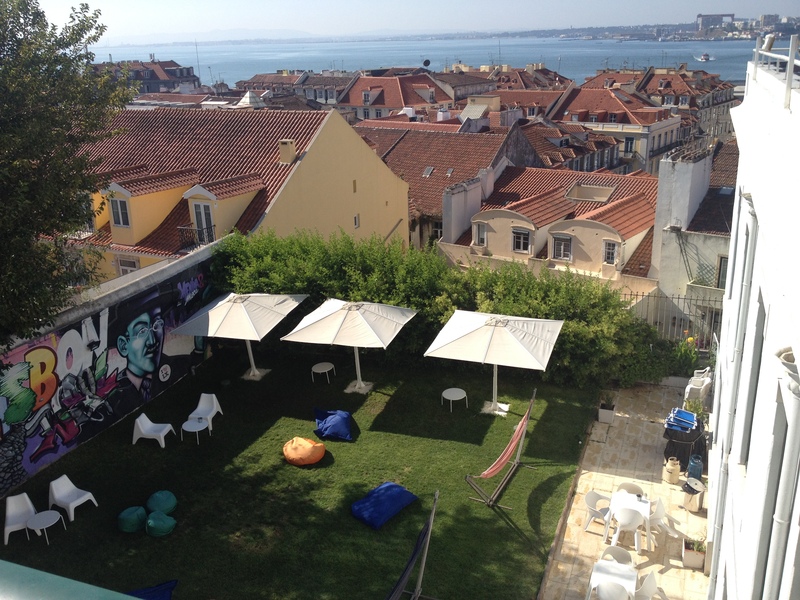 The garden in back was fabulous – hammocks, beanbags, chill music, and cheap drinks available at the hostel bar (1,20€ sangria, 1,50€ wine). Sometimes we didn’t even want to venture out! The roof terrace had a great view – and some really cute, built-in chairs – but no food or drinks allowed was lame (to respect the neighbors). Big drawer storage under each bed, with a lock, was much appreciated. Stunning views from certain rooms, complete with window seats, were breathtaking. 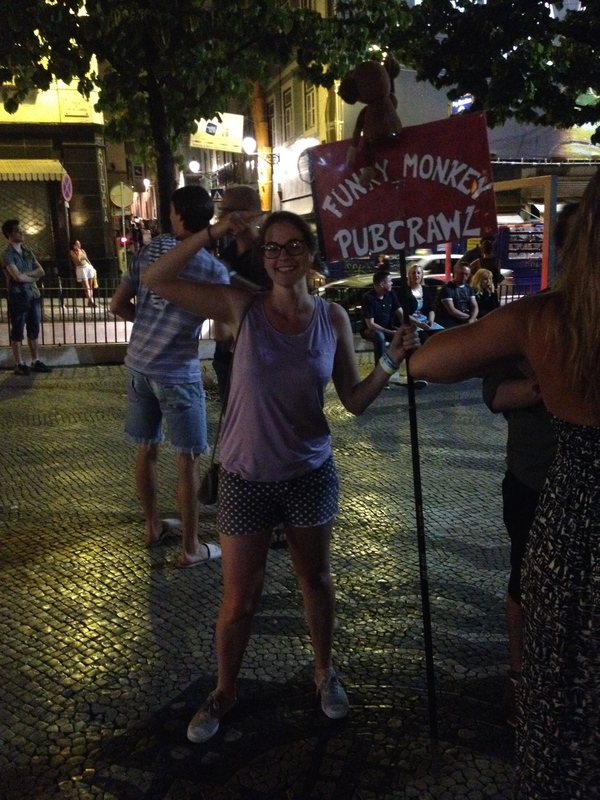 There are pub crawls every night – we did one once and it was fun! Our guide was from Lisbon. Some of his friends stopped by the bars, so it was interesting to meet some locals that way. There were lots of people on the street that would try to sell pot, sunglasses, and other things – unexpected, and a bit sad. Generally, the hostel employees were very helpful, but a few times we were ignored, which was irritating. They require guests to wear paper bracelets to be allowed to exit and enter, and it felt like we were at Santa Cruz Beach Boardwalk for four days. It got itchy, sweaty, and annoying after awhile! 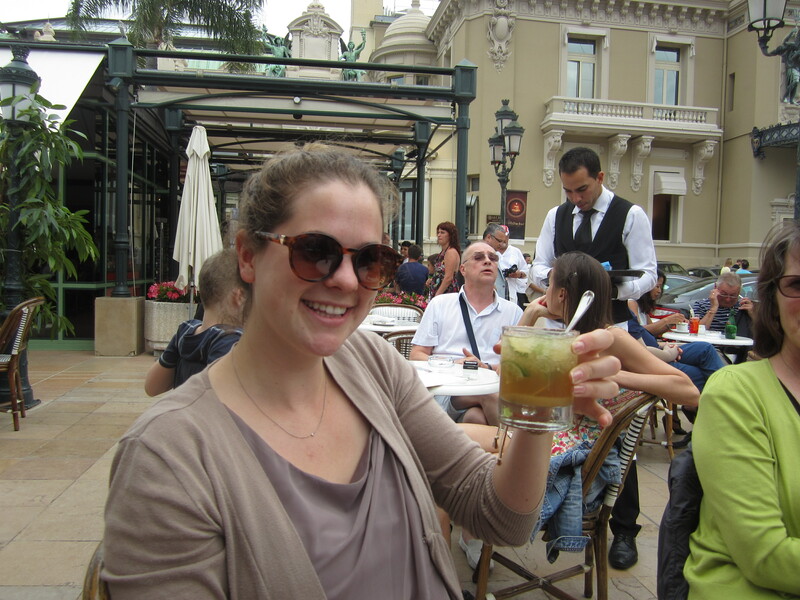 I went to Lisbon and Barcelona with my bff Ottilia this month! I’ll post some of the highlights. 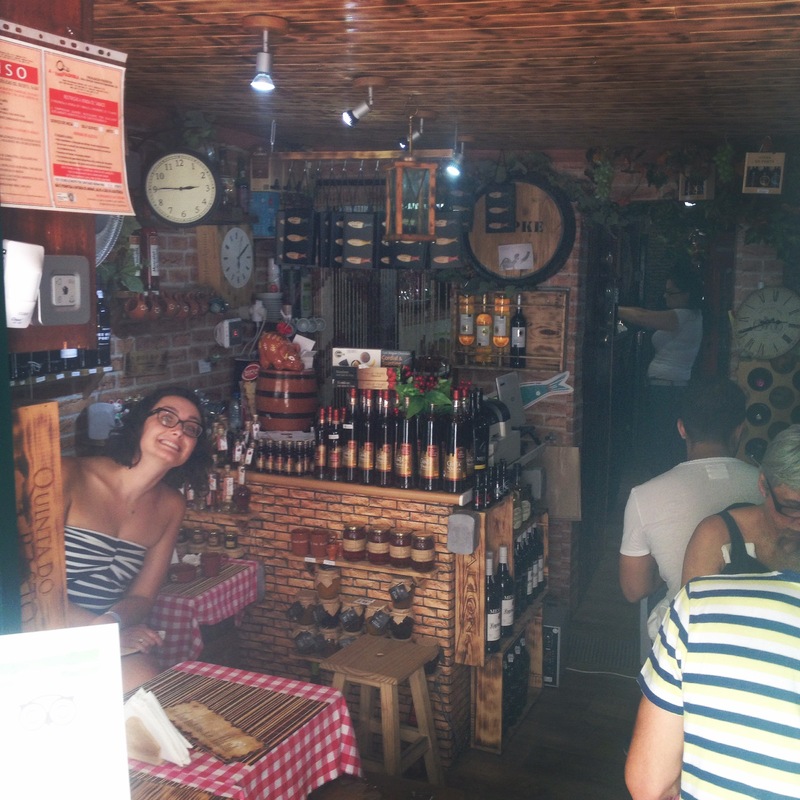 Here’s the first – a lovely cheese shop right near our hostel. 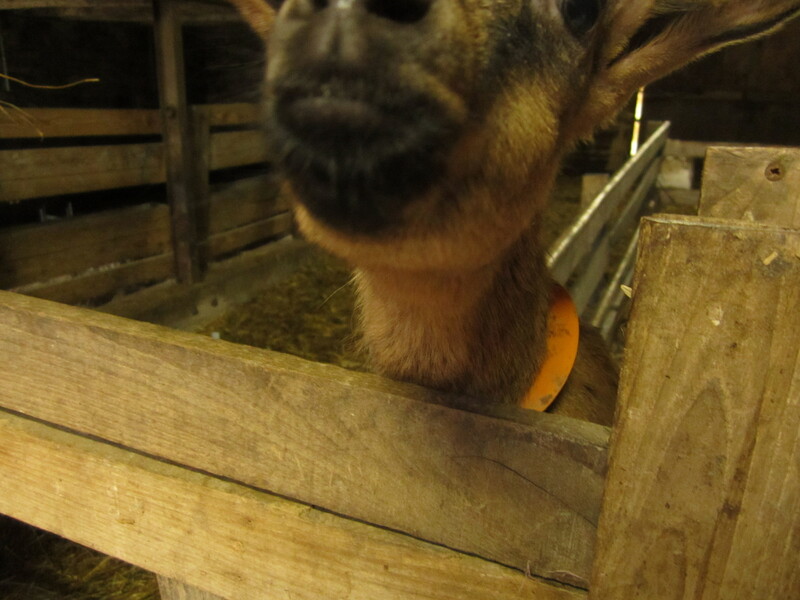 Ottilia is such a cheese-lover that she is part of a cheese club, and I will never say no to some great cheese. Since we were eating so many meals out, two of our nights we decided to stop into this shop for a wedge of cheese to eat with wine for dinner. Could there be anything better? 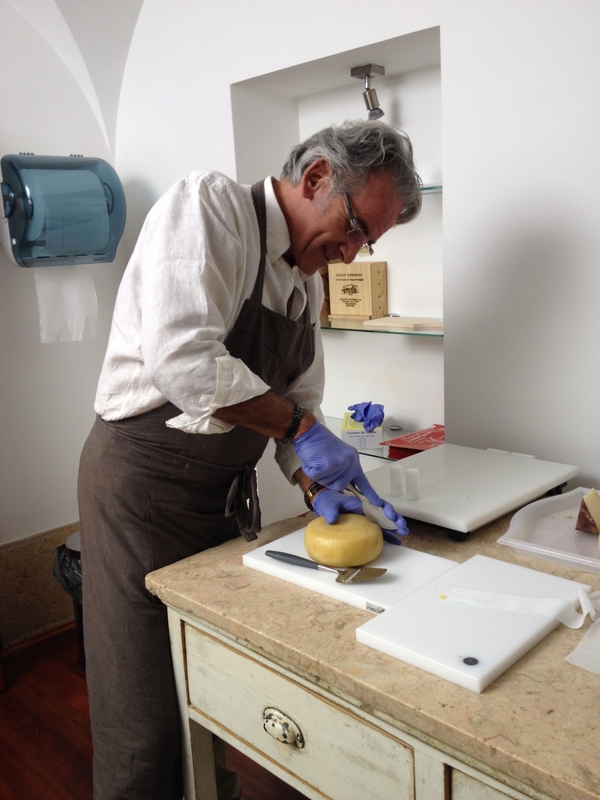 I’ve never had such good service in a cheese shop! They gave such a warm welcome, and were able to speak English with us to answer all of our questions. The shop has a few rooms – the back tasting room is the place you want to be! 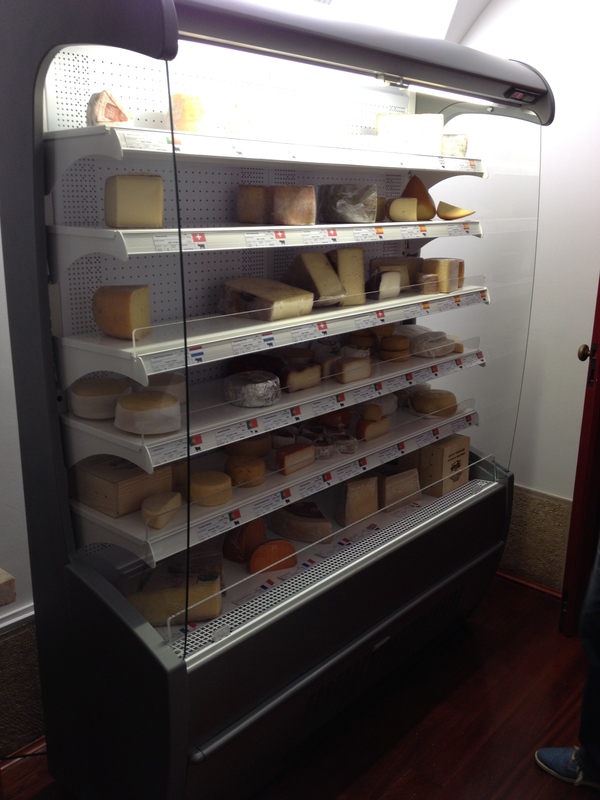 We tasted tons of cheese – they have a selection of the best from Portugal, as well as some from Spain, France, and England. They had never heard of Vermont or Wisconsin but we suggested that they look into our favorite sharp American cheddars. They were so generous, even cutting new wheels open to let us taste. The shop also carries different crackers, jams, and wine to go with the cheese. There was even a little section with boards, slicers, and books. They had a basket of these weird-looking things, and the man could not remember the translation in English. We were all very curious, so eventually we looked it up and it was carob – being familiar with vegetarian cooking, we knew it well. Funny to find it in Portugal! 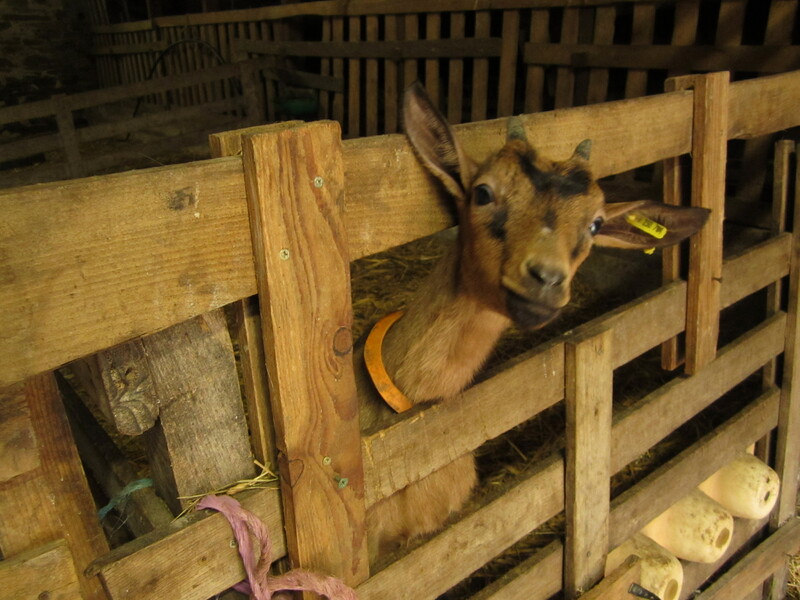 Yup, I’m that weird girl who felt the need to go back to a goat farm in a very small town in France. 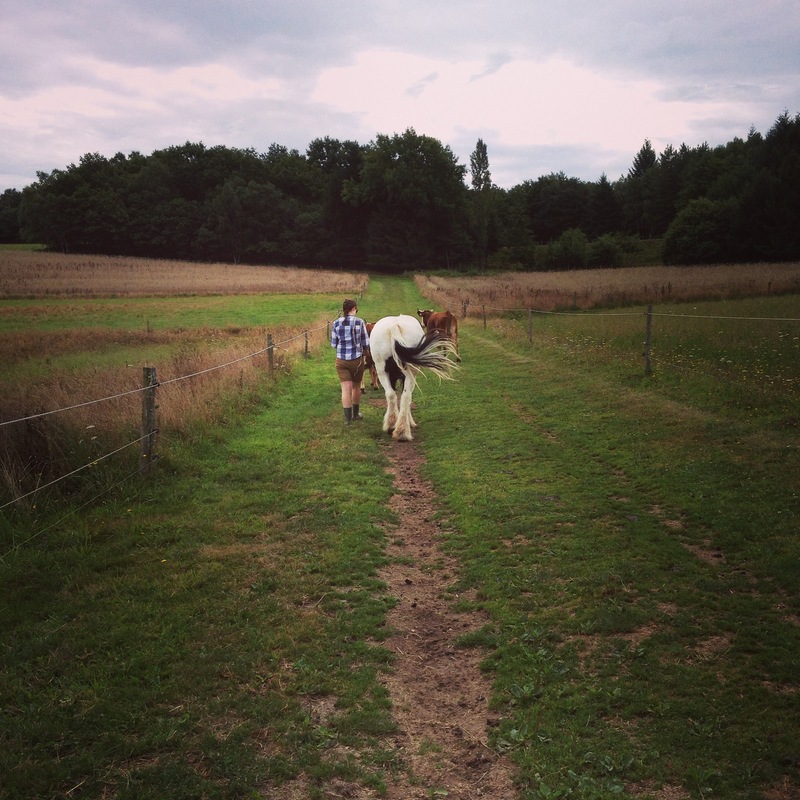 My first wwoofing experience was so unexpectedly eye-opening that instead of taking the risk and trying a new farm, I went back to the same one. I made a connection with the people and animals at this farm so I wanted to return. It was cool to come back and see what had and hadn’t changed since about a year and a half ago, and to increase my knowledge of the organic lifestyle. If one of the main goals of wwoofing is to inspire people to incorporate organic and sustainable activities into their daily lives, then they have succeeded. I am planning to try to grow some tomatoes and herbs on my terrasse next spring/summer, and I want to make an effort to eat more seasonally. As a non-vegetarian and a non-pet owner (although I want my own cat so bad), I am not the most animal-obsessed person in my life. 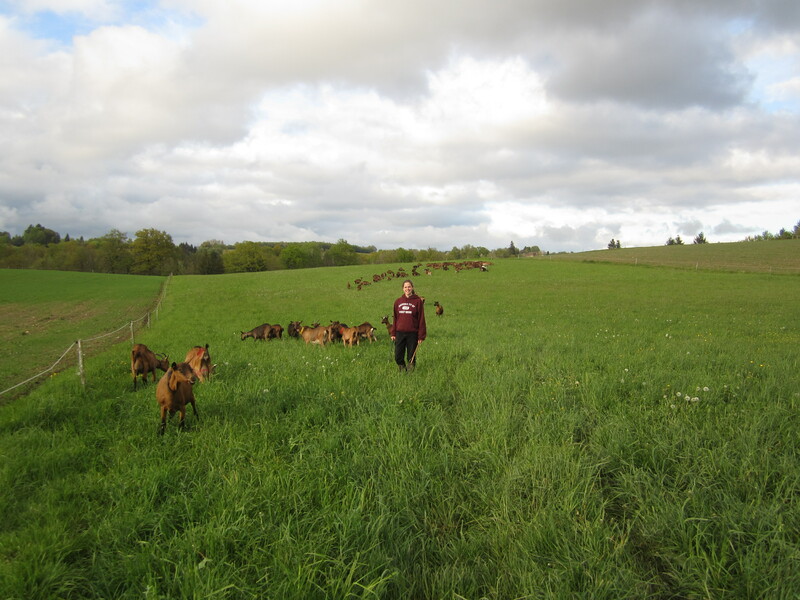 I really enjoy being around animals though – being more familiar with the farm this time around allowed me to pay attention and form little bonds with individuals goats and other animals. 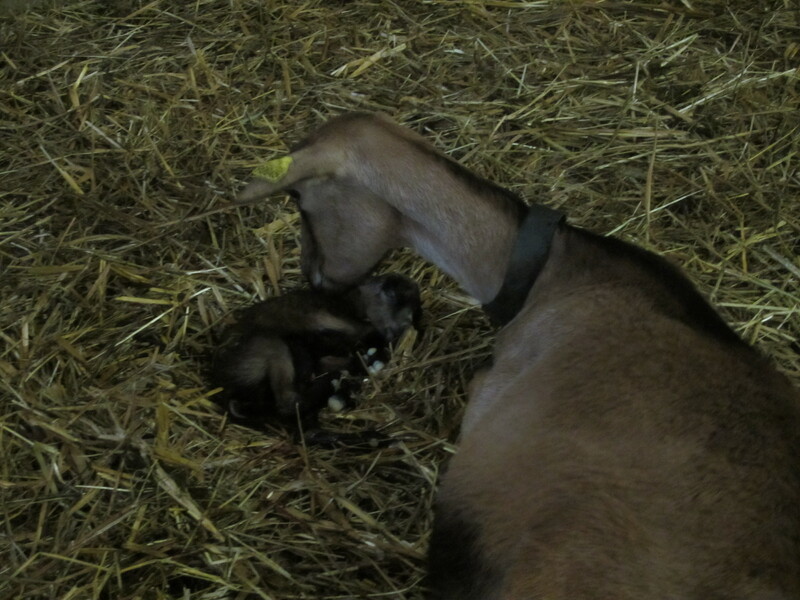 There was a 2-month old baby boy goat who was allowed to stay with the 100 or so lady goats. We quickly became “friends” during la traite, since he would come up to me and want to be pet, and try to eat my clothes. So adorable! 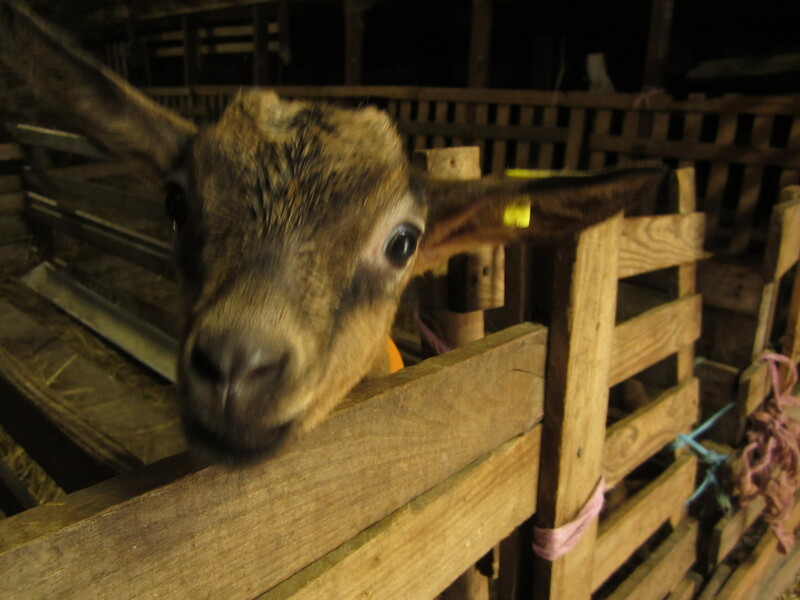 I had to be reminded several times that he would grow up to be a huge goat and no, I could not take him back to Paris with me. Sadface. As part of the work team of the farm for the week, I witnessed the highs and lows of life on the farm. 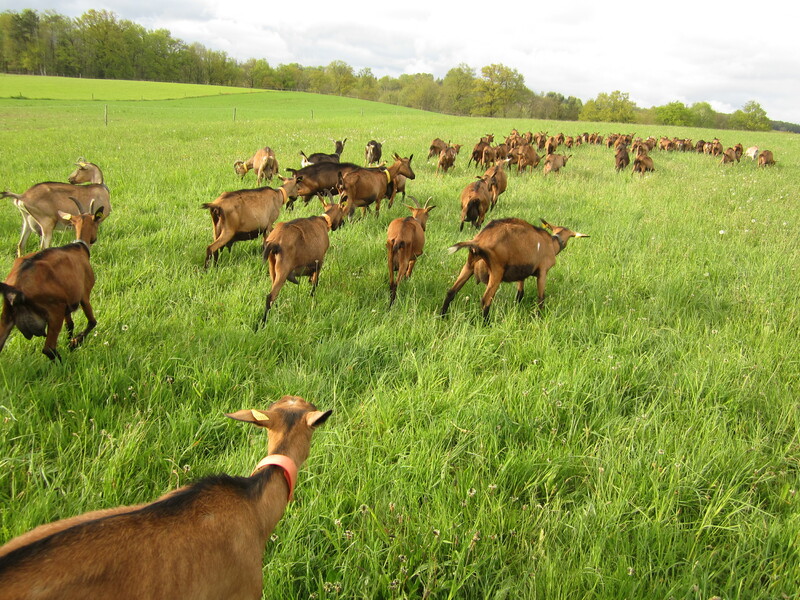 One day, most of the goats escaped from a field with normal grass to a neighboring one that held a different type of grain, not to be consumed at this time of year by the goats. The following day, they had horrible diarrhea – it was pretty disgusting. Gundula, Louise, and Maëva handled most of the dirty work, but I did help a bit with la traite and was terrified that they would poop on me (one of them did on Gundula!). 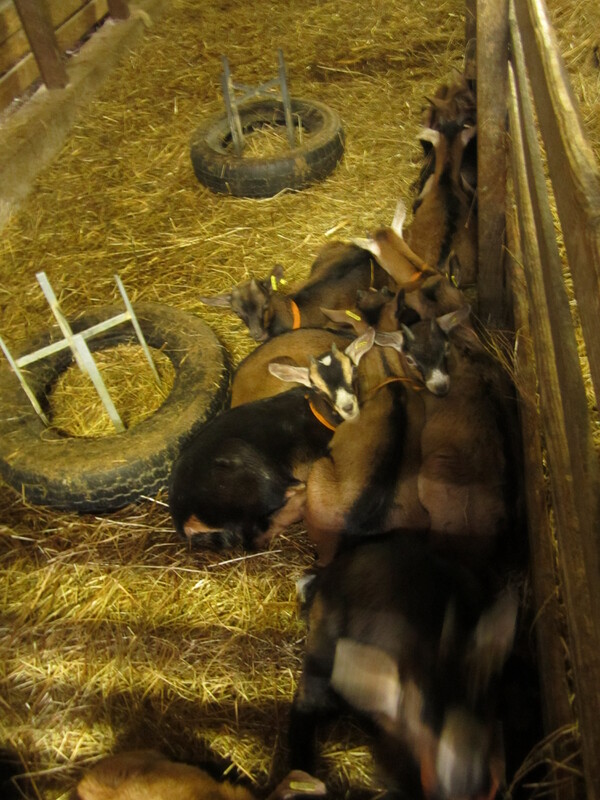 The daily cleaning of la chèvrerie took much longer that day since we needed to put a ton more hay and straw down to absorb it all. 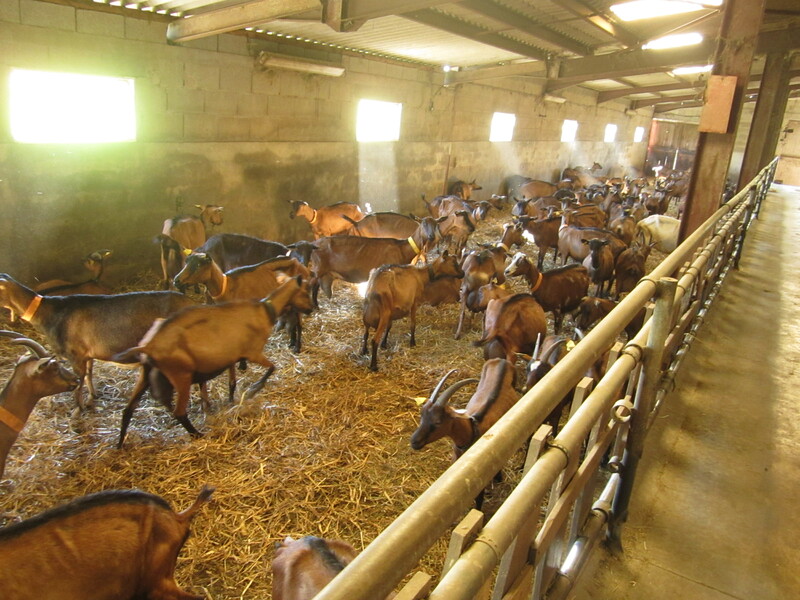 More importantly, the reaction to the grains that caused them to get sick is potentially fatal, and can also have effects on the goats’ milk production. Luckily, they healed the next day, but it was a smelly reminder of the perils of farming. Just like that, all the “tools” needed to produce one’s product could perish. On to less stinky subjects…it was a good choice to come in the height of summer. 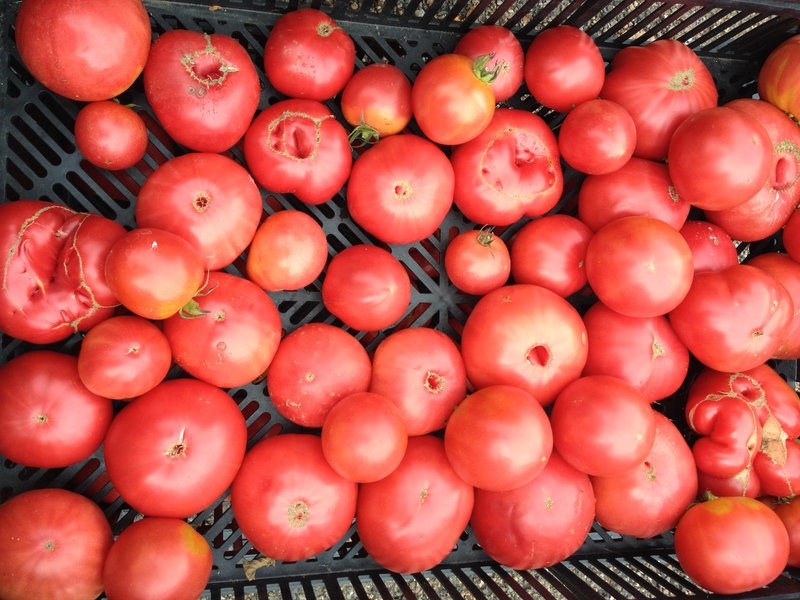 I ate fresh, organic, local tomatoes, zucchini, peppers, and onions in some form every single day. The mirabelle plum trees were perfectly ripe, and Maëva taught me to shake the branches to make the ripest fruit fall. She hadn’t even been tending super well to her garden since she has been so busy, but there were still mint leaves to be plucked up as an all-natural breath freshener, and other herbs and veggies that we could “harvest” and use at our whim. Over at the farm, I made a salad one day using a big head of lettuce that I picked out of the garden. We went blackberry picking and managed to grab a whole kilo, enough to make 5 small jars of jam. I’ve already finished one! I could go on and on, but basically, gardens are awesome and I’m wondering why the hell I live in Paris?! Hopefully I can live somewhere with garden space at some point in my life. I loved getting to know some of the people in this town, inhabited by 1200 people (according to Wikipedia). Maëva is friends with the coolest people – the other organic farmers (we had apéro at the produce guy’s house, that he rebuilt himself with his wife), people who make homemade pizza in wood-fire ovens located in a squat, the guy who delivers homemade organic bread for €2. I got the gossip about everyone we saw, down to the bitchy butcher’s wife. I’m so happy I went back to the farm. Not only was it great to see everyone again, but if I randomly was forced to drop everything and run a goat farm, I feel like I would be well-equipped to do so. And I’m no longer under the delusion that living in a small town is as boring as we make it out to be. There are plenty of advantages to a lifestyle outside of a big city, things that I forget about when I’m in my hectic Paris rhythm. It’s just nice to remember that there are other ways to live in the world, in case I ever tire of big-city life. OMG let me tell you about my new favorite restaurant – 5€ for 10 raviolis! But French people are weird and what they call raviolis are what I call potstickers, so don’t go here expecting any cheese or tomato sauce. My friend Kate brought me here a few weeks ago and I went again last weekend after suggesting it to a friend for her birthday dinner. It’s a little hole-in-the-wall place right in Belleville. The menu is simple – tons of raviolis in different incarnations either grillé (fried) or à la vapeur (steamed), plus some soups and salads. 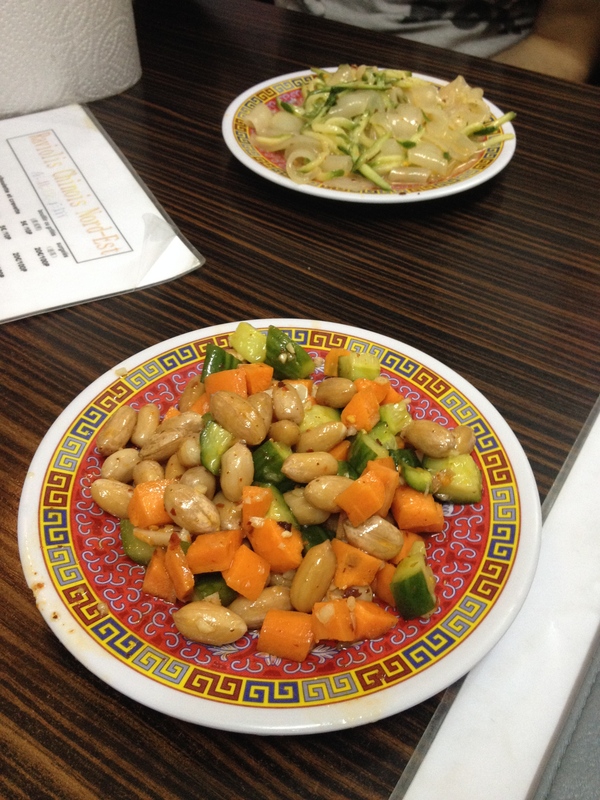 I really enjoy the porc/poivron ravioli, and I became obsessed with their peanut salad! It’s just carrots, cucumbers, and peanuts in a really spicy dressing (hot chili oil and raw garlic are the only ingredients I could figure out but I’m sure there are others) – but there’s something about it that’s just so good! I’ve attempted a version of it at home because I was getting major cravings for it after eating there the first time and I can’t make it up to Belleville every day. Dice up some carrots, cucumbers with the skin on, radishes (my addition), and mix them with salted peanuts, some hot chili paste or oil, half a minced clove of garlic and a bit of vinegar for a zingy and crunchy salad! 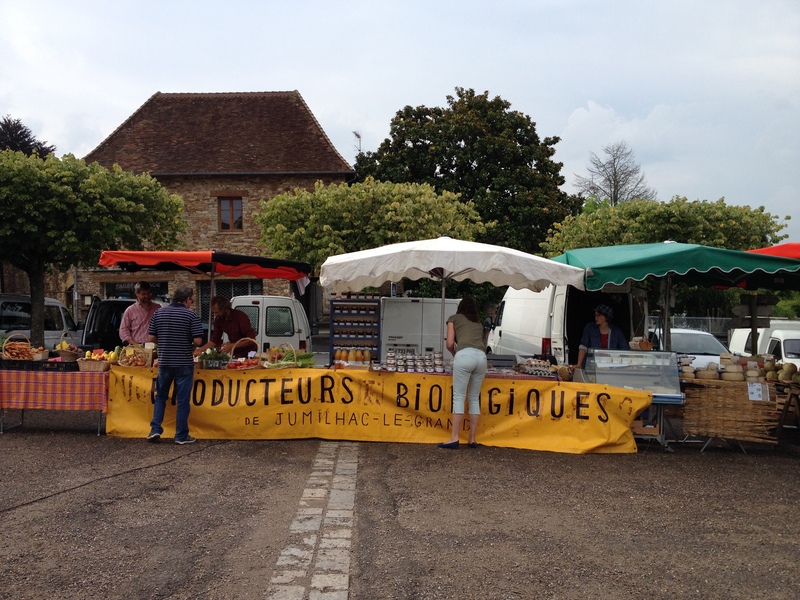 This place is a must for anyone on a budget, or if you simply want to change it up from the old jambon-beurre on baguette. 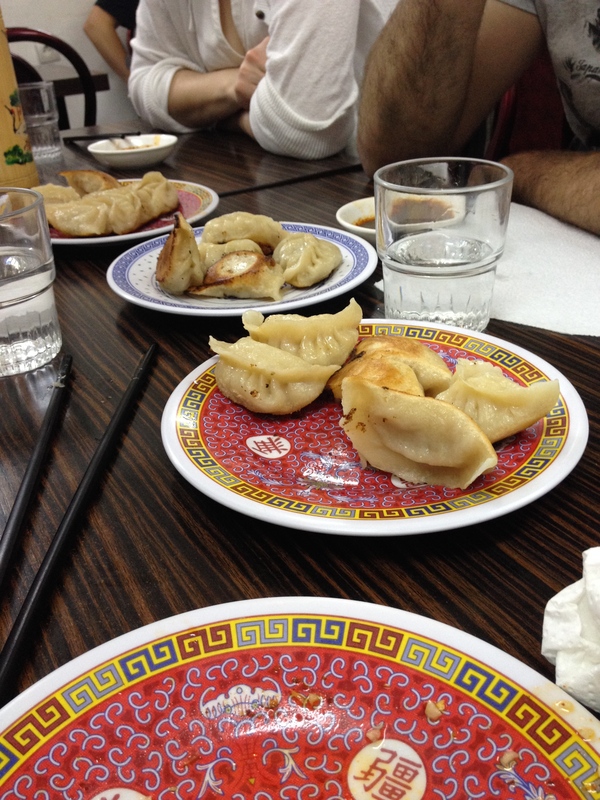 There is one non-meat version with tofu that my friend seemed to enjoy, so vegetarians won’t be completely left out. The service was friendly and quick both times I went. Oh, and if you realllly love these, you can purchase 100 frozen ones for 20€ – I’m so tempted but I think I’d eat them all in one go. I think I mentioned once that I would write a post about the French classes I took once I finished them. *Warning: this is probably really boring unless you are interested in taking these classes. Last spring, I knew I wanted to stay in Paris but I couldn’t find a job, and I didn’t feel ready to apply for a Master’s. A friend of mine told me about the classes and I realized it was the perfect way for me to stay in France. It would allow me to get a student visa, and I could build a more solid grammar foundation. Signing up for the classes is pretty painless. Most of the people in the office speak English or will be patient and nice if you speak French. You can even sign up online before you come to France. If you are getting a student visa, it’s better to sign up beforehand so that you can use the receipt of payment as proof of enrollment for the student visa application process. I did the fall session in level B1-avancé (=intermediate level) and the spring session in level B2 (=advanced). A week or so before the classes began, I took a test (written, listening, oral) and the school placed me based on my results. In true French fashion, I wasn’t notified of the location or hours of my classes until the day before they began. The school and teachers are flexible about moving to different classes if the level is wrong or if the hours don’t work with your schedule. Don’t be shy about this – you are paying a lot of money, and four months is a long time if the content is too hard or easy. There are lots of options for the type of courses you take (all the information can be found on the website or at the office year-round). I was in the “Cours de Civilisation” which means that I had 2 hrs/day 5 days/week of grammar, 3-5 hrs/week of phonetics, and 3 hrs/week of lecture classes on various topics. In the fall semester I did a normal class 5x/week, and in the spring I did the au pair option which excludes Wednesdays. Friends of mine took Business French and Master’s Prep, which I can’t review personally but they seemed to enjoy them and learn a lot. There were about 15 of us in the class. Professor – M. Morethe He gets an A+ in my book! He was very young (under 30) but had several degrees in literature and philosophy – basically he was HELLA smart (well-read, spoke lots of languages on at least a basic level) but the best part is that he was a great teacher. Teaching a foreign language is a very specific skill and he had it. He was patient and never condescending, he pushed us to get to a higher level, and he would explain things in several ways until everyone could wrap their separate brains coming from different languages around each concept. He organized the class very well and each week we knew exactly what we would be working on. Class structure/grammar – lots of exercises in a book that you purchase, and tons of worksheets and packets that he gave us. I had several lightbulb moments when I finally understood concepts, words, and tenses that I had been hearing the whole previous year. You can learn a lot by ear, but it’s great to combine that with someone going through and explaining each rule to you and practicing with written exercises and examples. He also gave us lots of great worksheets and study sheets that I will keep forever as reference. Class structure/reading – The course fee includes a literature book full of excerpts from French literature. We read a few of these as well as news articles and discussed and studied them in class. Class structure/writing – We had a few mini papers assigned throughout the semester. He encouraged us to use new words and grammar concepts that we had learned that week. He would hand them back corrected, AND talk to each of us individually about the strengths and weaknesses in our writing. I found this very valuable because I am usually so traumatized by grades (even if they are good) that I put corrected work away in a folder and never look at it again. (I do the same thing with all the recordings of me singing – issues?) Because he spent so much time correcting us, I felt motivated to learn from my mistakes, and put extra effort in for the next essay. Class structure/listening – We listened to recordings and had to fill in worksheets with what we’d heard. There were a few fun days where we got to listen to a pop song and fill in the blanks, and analyze the poetry. Class structure/speaking – We did group work (writing and performing skits) and tons of discussions. Class structure/evaluation – We had tests every Friday. Towards the end of the course we did lots of practice tests to prepare for the exam. The actual exam felt really easy because we were so well prepared. I got REALLY into the class and did all the homework and attended every class I could and made an effort to focus in class. I paid for it with my own money, so I didn’t want to waste a single centime. As a result my French improved drastically this year. All the grammar work can be boring and tedious but I think the combination of my enthusiasm and the great teachers kept me motivated. The set-up was the same. I was hoping to have M. Morèthe again, but I had a different professor. At first he really rubbed me the wrong way, but by the end I liked him well enough. His teaching style was different, not as clear and not as organized. But after a few weeks, I got used to his teaching style and I did learn a lot from this class as well. The only difference in the class structure was that each student did a 10-minute presentation. We brought in an article, went over the vocabulary, and led a small discussion with the class. It was a fun activity and great practice speaking in French as a leader. Every other week we had a daily hour-long phonetics class. The first 30 minutes we took notes on theory and wrote down all the words and sentences we would be using later. The second 30 minutes we went to the lab that was set up with listening stations. Using our notes from the first half of class, we repeated after our professor’s perfect French, which was spoken into our ears via headphones. It was all recorded so we could listen to ourselves compared to her and correct our pronunciation. She would “plug in” to each of us individually a few times per class and help us with our trouble spots, which was very valuable. I only remember my professor’s first name (Aya), but she was great! She was very nice and gave constructive criticism to help all of us improve and sound more French. The second semester was a similar setup and I had Anne (again, don’t remember her last name) and loved her too! These classes are one hour long. There were several more options in the spring than in the fall. They are held in a big lecture hall and many students attend – 100 or so? 200? I am bad with numbers. After attending a private, liberal-arts university in the US, these classes were cake for me. I never had more than 30 students in a class at UPS, so this was my first big lecture experience. I have to say that I prefer a smaller, discussion-based class. But because I was so enthusiastic, I made a big effort to stay awake and alert in the often boring, droned presentations. The classes are structured to be an overview of the subject, basically a 101 sort of class by US standards. The classes are for all levels, so the professors speak very slowly and use very simple vocabulary. I think the intention is not to actually learn about the subject, but to hear French being spoken about a topic other than grammar. I understand that it is probably difficult for the school to organize the classes so that the professors aren’t wasting their time and that all the students get a chance to take as many classes as they can. However, it would be nice if the school could at least separate beginners and advanced students. I would have liked to write a paper or do some sort of project, anything mildly stimulating! Despite the so-dry-I-was-afraid-my-notes-would-combust nature of the classes, I made an effort to study every week and did very well on the tests! I felt that it was important to learn the basics in all these classes, as the arts and history are integrated into la vie quotidienne here. Even at parties with young people, I’ve relied on my knowledge from these classes to understand references French people really do make. Ugh, so classy. I could only attend one of the classes due to my work schedule. Lucky for me, it was the Gastronomie class (everything to do with food)! The content was often comically easy. 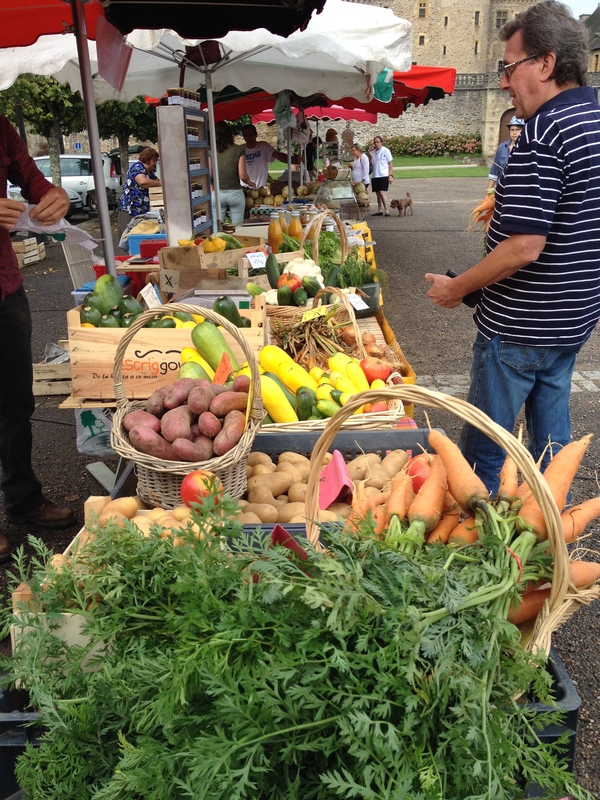 Each week covered a different aspect of the French diet: bread, meat, fish (skipped that one), dairy, produce, wine, cheese, dessert. Actually, there were two classes on wine and they were the first two! Priorities! Sometimes the class was agonizingly simple – are there really people in the world, among those who move to Paris and sign up for these classes, who don’t know what a croissant is? On the other hand, I learned very useful things such as the names of certain dishes from certain regions, and a lot about wine that has served me well in purchasing and choosing what I drink. The professor was clearly a foodie so it was enjoyable to listen to his explanations. He would say basic things like “this lighter wine goes with this dish to balance the acid” but in French and with the light in his eyes it sounded so beautiful. One of the best parts about the course is the other students. I had expected the classes to be filled with Americans, so I was pleasantly surprised that we seem to be a minority in the very global student population. I met and befriended people from near and far. One of the more intriguing aspects of class discussions was seeing who actually would speak up (usually the Americans, Canadians, Russians, and those from Latin cultures) and who had to be almost forced to speak (some of the Asians, northern Europeans). Hearing what everyone had to say was always surprising and thought-provoking. I loved these classes. Overall I give them a B on the American grading scale; on the French grading scale it would be much lower! I hope this was helpful for anyone considering doing this program! If you have any questions, please visit their website or their office first, but I am also happy to talk about the program if you have further questions. 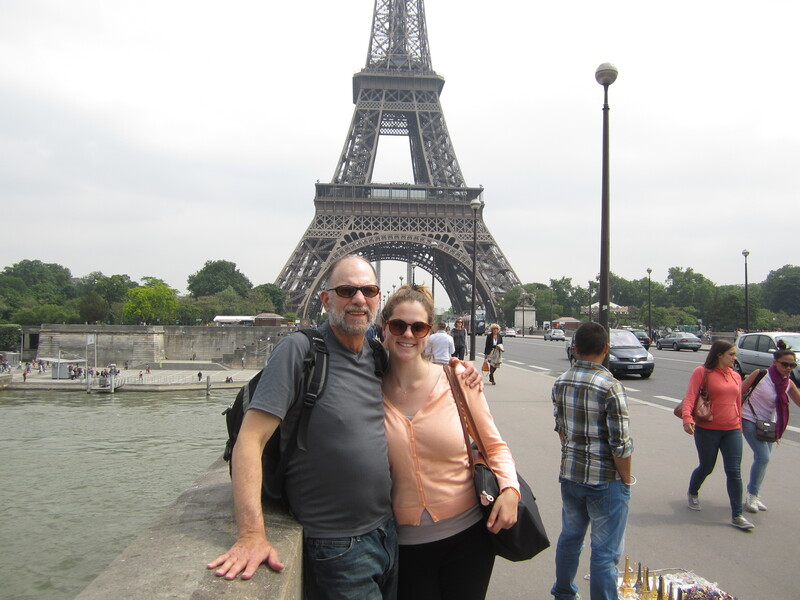 So in Paris, we did plenty of things in sometimes rainy, sometimes boiling hot weather. June in Paris, it turns out, is not always the best. But, it didn’t matter because we were together. It’s so fun to see Paris through the eyes of someone who doesn’t live here. We found a Holocaust monument that was right in my old quartier that I never noticed! 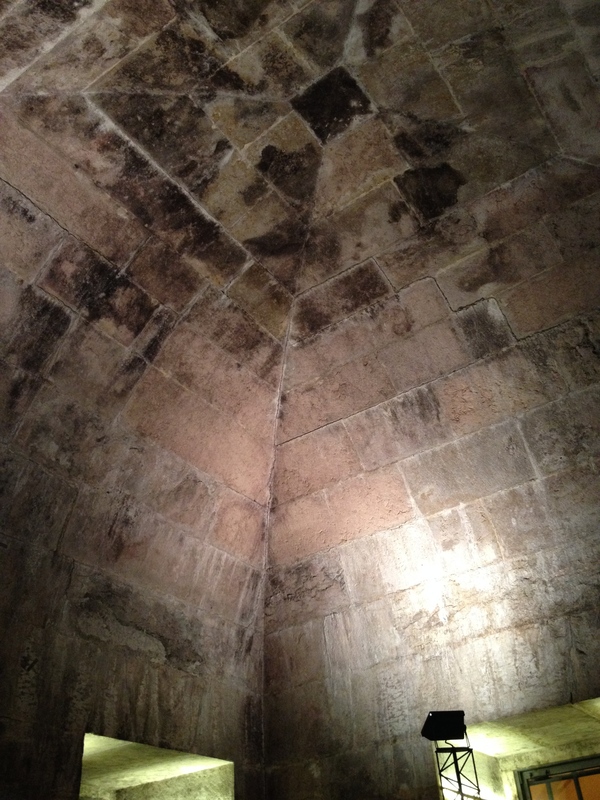 Plus, we went up the Arc de Triomphe and checked out the Jewish Museum, two things I hadn’t had a chance to do yet. We had an excellent meal at Le Florimond for my mom’s birthday. We split a bottle of champagne to toast her, all of our dishes were amazingly prepared, and the waiters even sang her happy birthday! I had the best confit de canard I’ve had yet, plus I tried lobster in a ravioli dish for the first time (not obsessed but I didn’t hate it)! My mom got a beef stew-type thing that came in a mini dutch oven – very cute, and the best beef stew I’ve ever tasted! I don’t remember what my dad got. I definitely recommend this restaurant if you find yourself in Paris for a special occasion. It’s very cozy and intimate, they are more than happy to answer questions or translate any of the French, and they have English menus too if you need it. 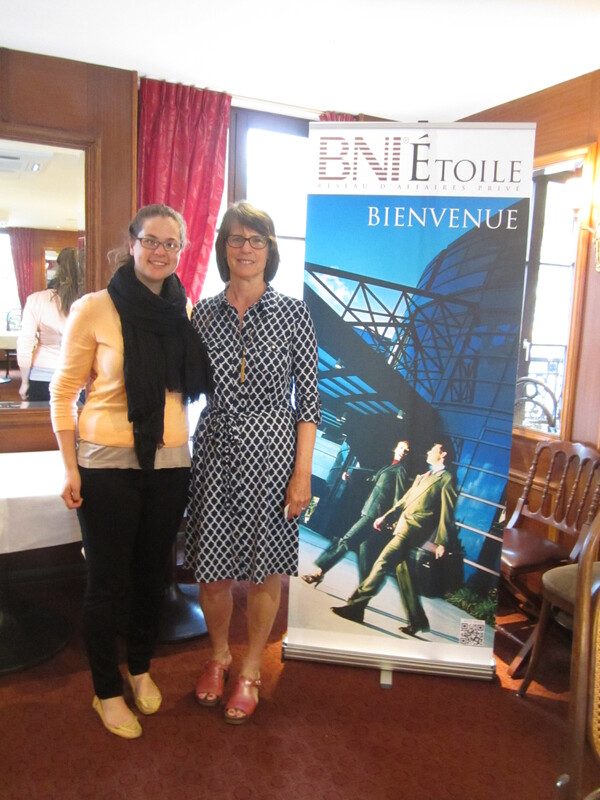 My mom and I at BNI – it was interesting to attend a French networking event! My favorite part of their stay was our trip to the south of France. 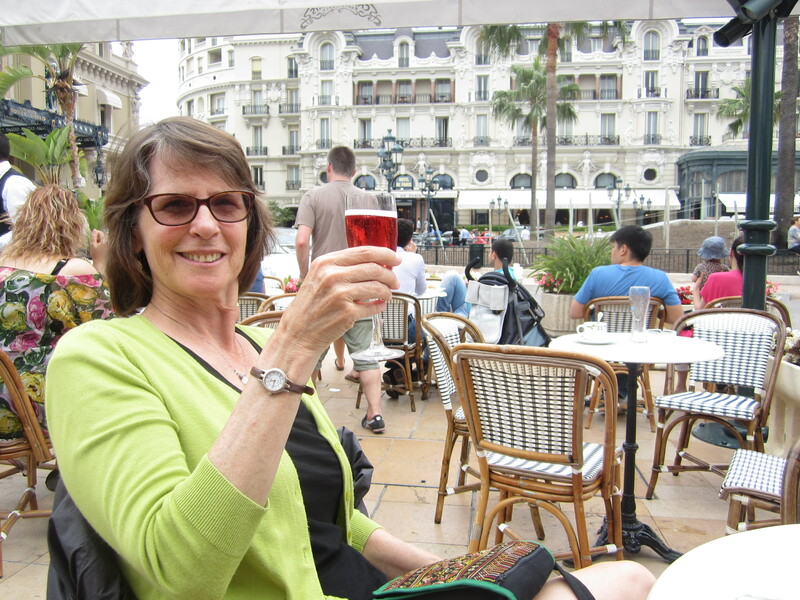 We spent three days in Nice and also visited Antibes (our favorite), Monaco (meh), and Cannes (meh). We stayed at the Hotel du Suède which I’d recommend – it’s clean and nice but most importantly, it’s located about two seconds from the beach! The surrounding streets are pretty touristy, but I have to admit that it was useful to shop in the souvenir shops – we got some cheap mats to lie on the sand in and I found a cheap bikini to tan in! 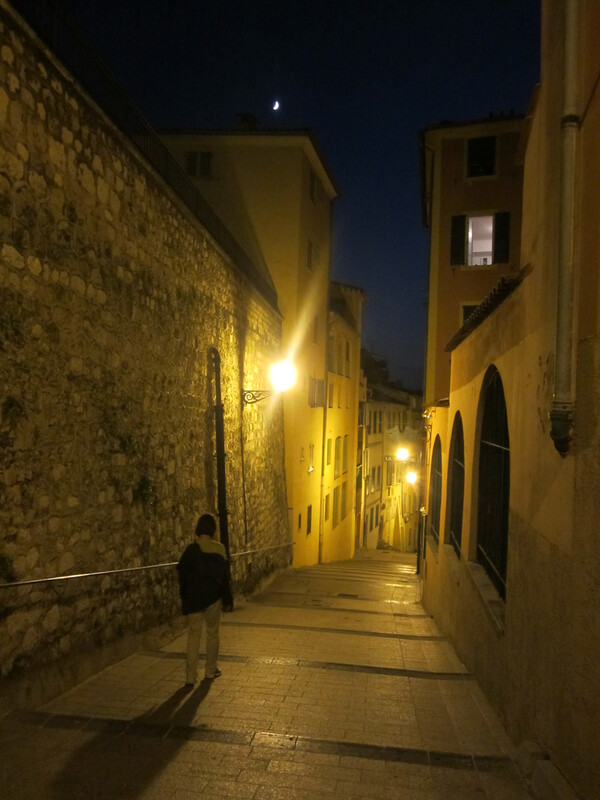 We were about a ten minute walk away from Old Nice – little winding streets with tons of restaurants and bars. We had one so-so meal and one fabulous one there. 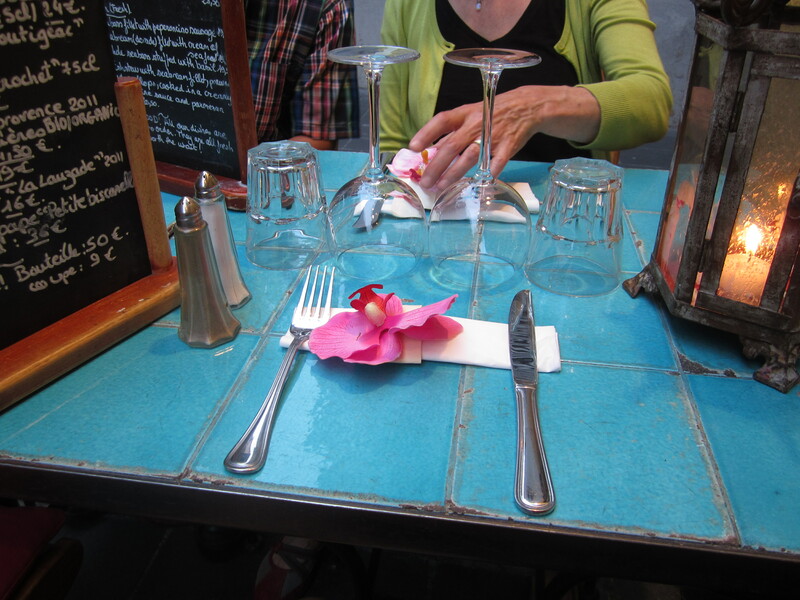 Chez Juliette had beautiful table decorations, great service, and lovely food. If we had stayed another day we would have gone back, it was that good. It was located next to a gay bar, complete with a cross-dresser (transvestite? what is the politically correct term for a man who dresses like a woman?) in a pink wig who was going around flirting with everyone, and mimicking the capoeira performers that started doing crazy backflips on the street. We got gelato a few times at Fenocchio’s – they have tons of flavors and all the ones we tried were great. We didn’t spend the whole time eating and beach-ing. 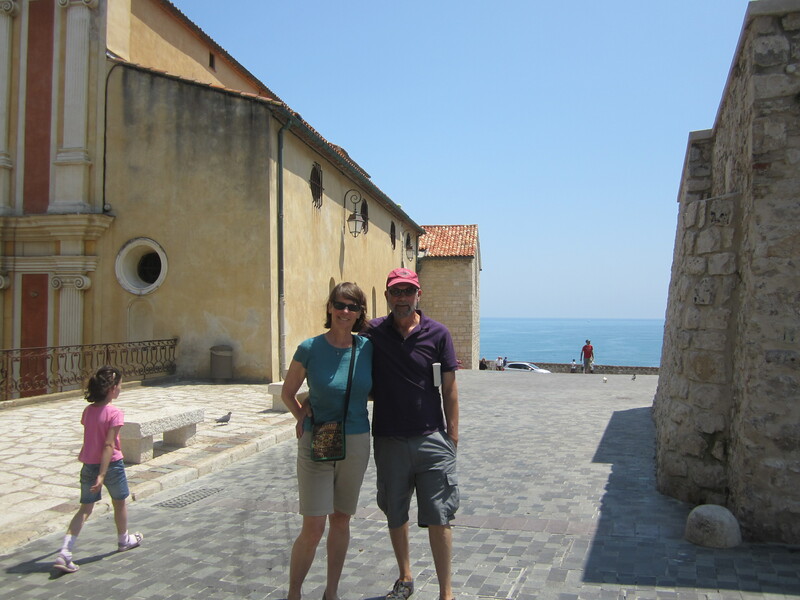 We managed to hit up 3 different museums – the Matisse museum in Nice, the Picasso museum in Antibes, and the Chagall museum in Nice. My favorite by far was the Chagall museum – they had lots of his paintings, including many early ones I have never seen before. There was also a great 40-minute film that included interviews with him as an old man and footage of him painting. He had a great personality! It made me wish that I could see similar interviews with all my favorite artists throughout history. The Matisse museum had a smaller volume of works, but I think there was an exhibit traveling elsewhere that was due back at the museum in July. The Picasso museum had a beautiful interior and a lovely back garden with ocean views. 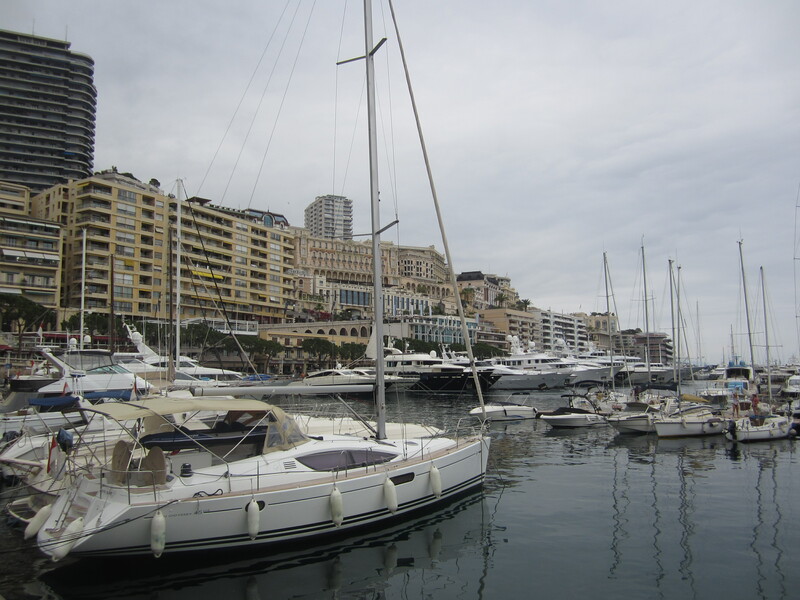 On our last full day in the south, we drove over to Monaco. It was cool to check off the list, and to visit the second-smallest country in the world, but overall we were underwhelmed. It might have been the clouds, or perhaps the commercialism that glints off every yacht and high-rise building. It’s basically a giant luxury shopping mall-turned-city. We were also dismayed to watch a yacht turn on it’s engines and run them for 30 minutes while docked – way to respect the environment, guys! 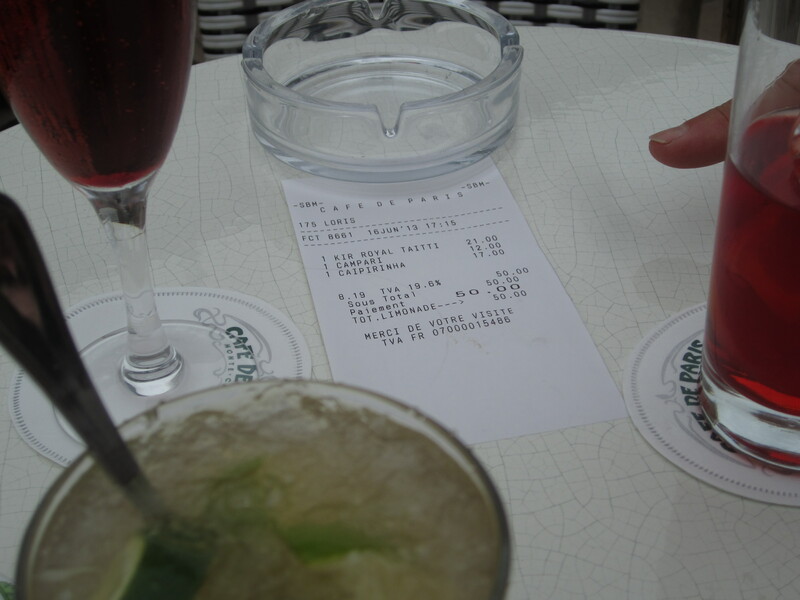 We did have some great cocktails and people-watching in front of the Casino. Cheers to a great trip! We really loved the Nice area. If you rent a car, it’s so easy to get out and explore the nearby towns. 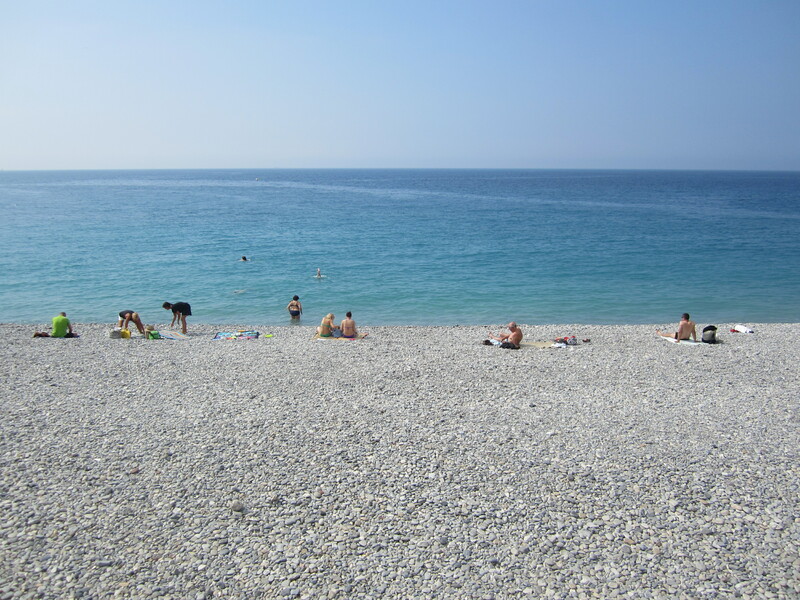 I think if we had stayed in Nice for 3 days straight it would have gotten old, but with all the exploring we did it was hard to leave by the end! Overall, my parents’ visit was fabulous. 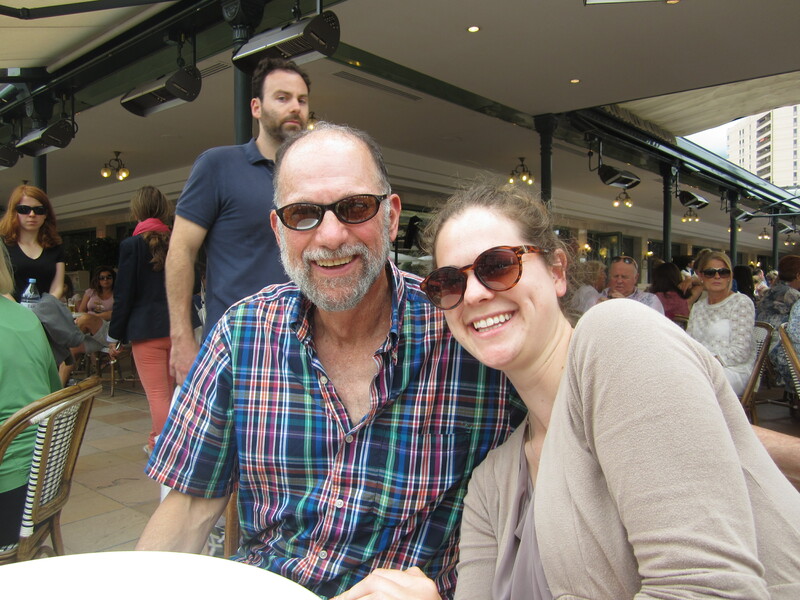 We made some great new memories – some good (so much time to talk face-to-face, my mom and I making fun of my dad’s attempts at French – people kept responding to him in Spanish or Italian! 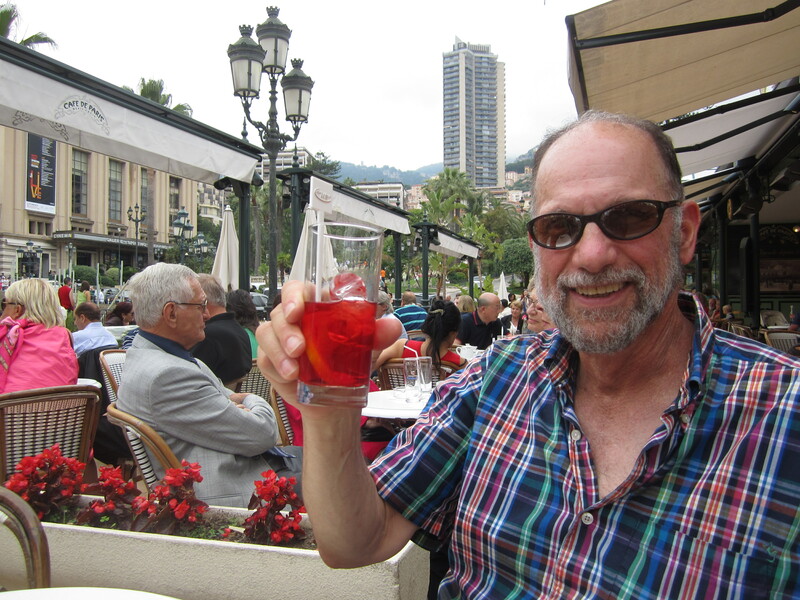 although by the end of two weeks he was pas mal, cocktails and wine all the time since they were on vacation and I’m, well, I live in Europe), some bad (my dad getting yelled at by a crazy street cleaner, and simply not having enough time). It’s so fun to see Paris through the eyes of someone who doesn’t live here. We found a Holocaust monument that was right in my old quartier that I never noticed! Plus, we went up the Arc de Triomphe and checked out the Jewish Museum, two things I hadn’t had a chance to do yet. 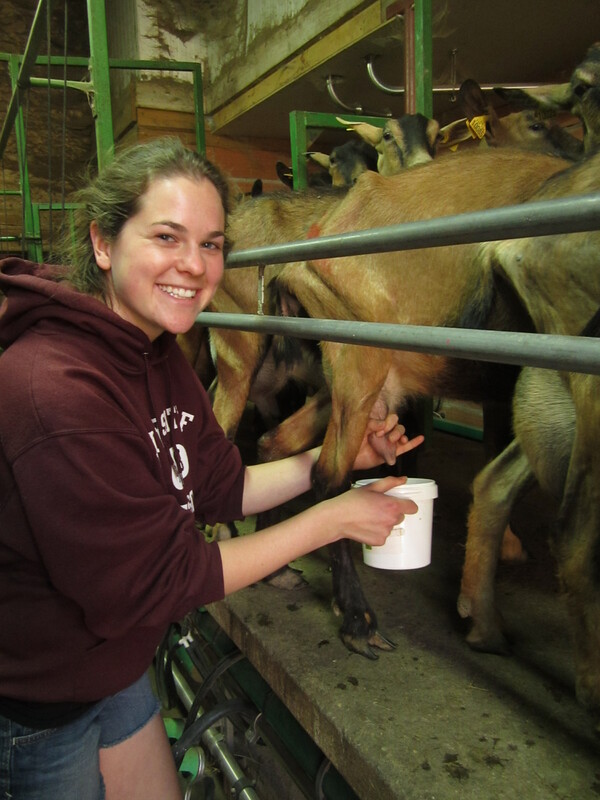 So every day when milking the goats, I wondered how the milk would turn into cheese. 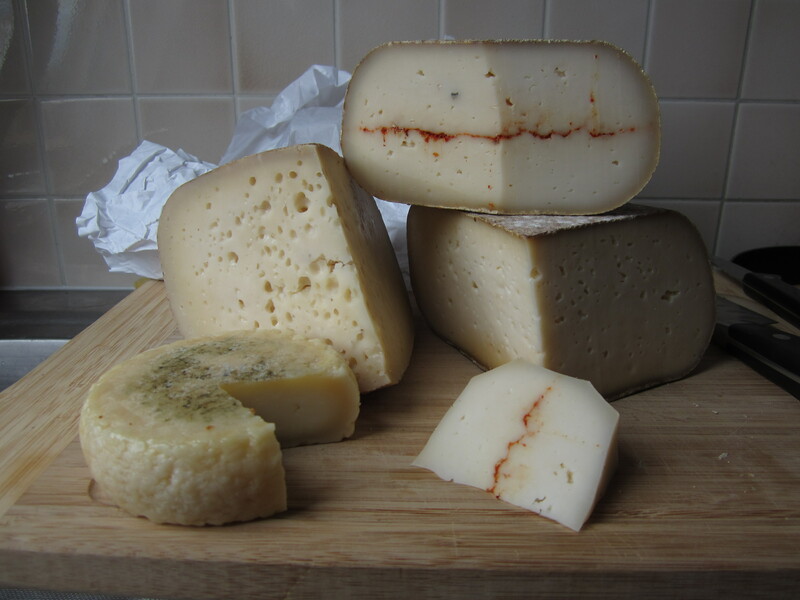 Louise is the cheese-master (cheese-mistress? ); every few days there were times when in the middle of a meal she would need to run up to la fromagerie to deal with the cheese. It turns out it’s a time-sensitive process. 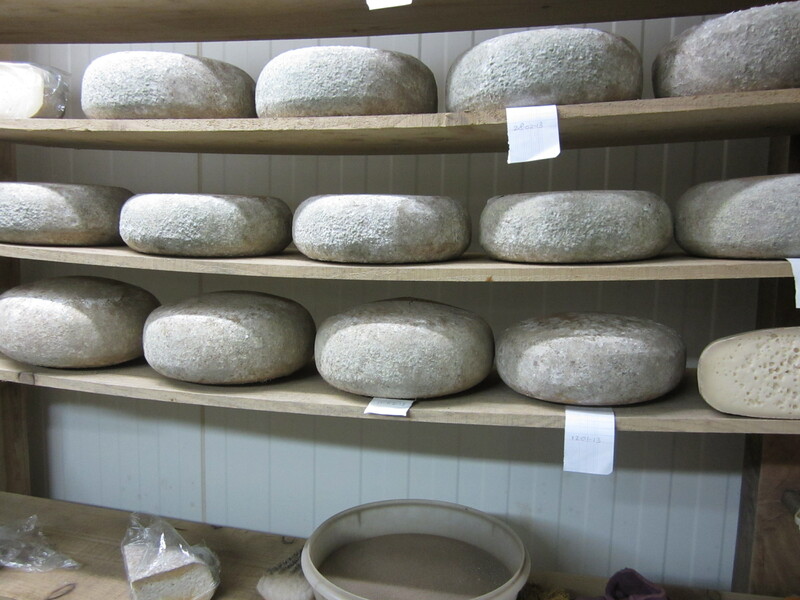 After getting to know her a bit I gathered the courage to ask if I could come watch her make the cheese. Before she could respond, the reaction of Gundula and Maëva gave me the impression that few were allowed to enter the fromagerie. Louise didn’t say yes, but she didn’t say no either. Well, I must have passed some sort of test because the next day we made a plan for when I could come watch. I was so curious because just as with everything else I’d witnessed on the farm, I realized I’d been benefiting from the deliciousness that is cheese, gorging on it in countless sinful dishes of mac n cheese, dips into fondue, numerous grilled cheese sandwiches, and more my entire life, without really knowing how it comes to be. 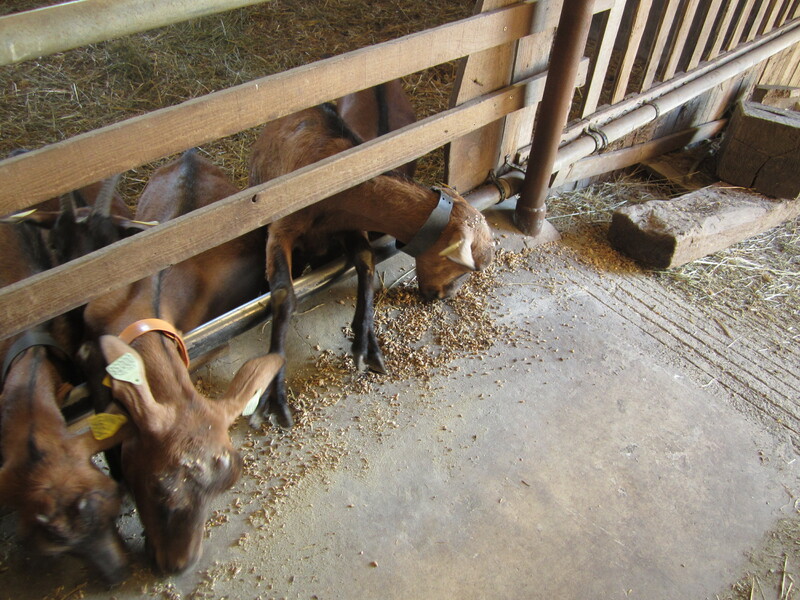 So, allow me to show you how goat cheese is made! 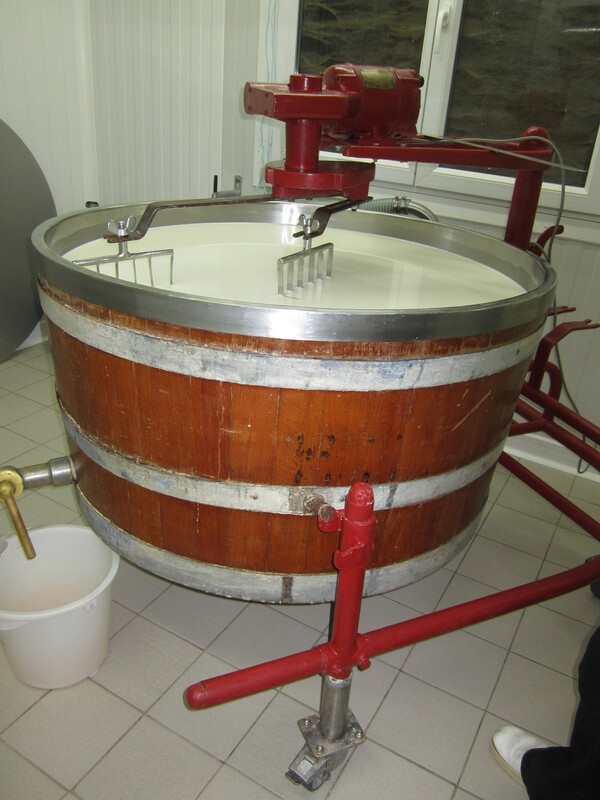 During la traite, the milk is pumped into the room next door through a big vat, up a pipe, and into another big vat that lives in the fromagerie (cheese-making room). 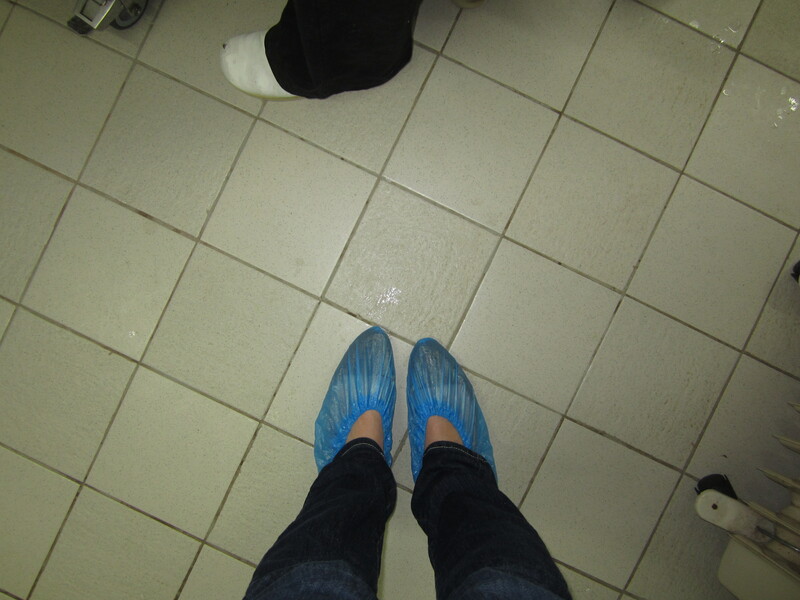 This room is completely sterile – I had to wear those shoe covers that surgeons wear! It’s starkly different from the rest of the farm. 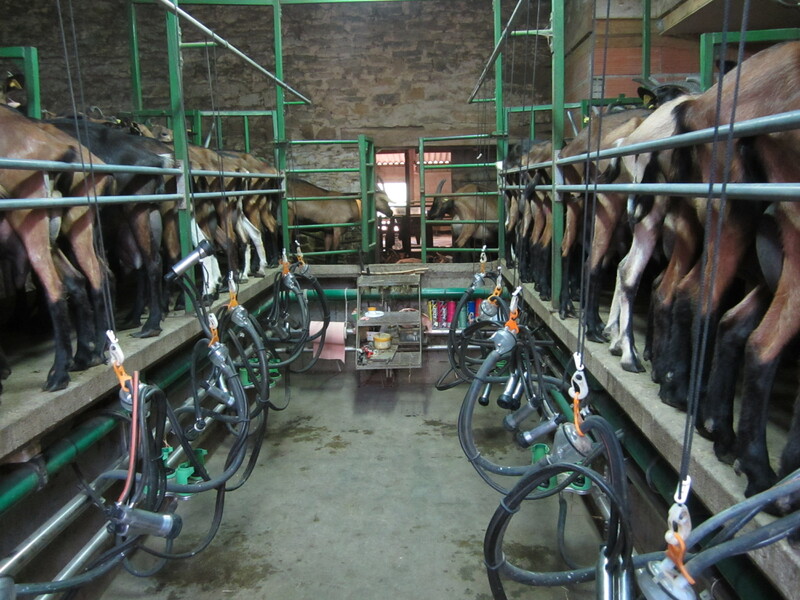 If the milk is coming directly from the goats, it will be around 35°C and needs to cool down for a few hours. If it’s been sitting all night (she doesn’t make cheese every day so sometimes this happens) then it needs to be warmed up. After it has reached the right temperature, she adds some sort of acid or mineral or something (didn’t quite catch the word, and as I’m clearly never going to be a journalist I didn’t write anything down at the time or clarify later) to help something happen in the process…Then the machine is turned on and a whisk-like attachment moves around in the milk which has thickened because of the mystery thing that was added. 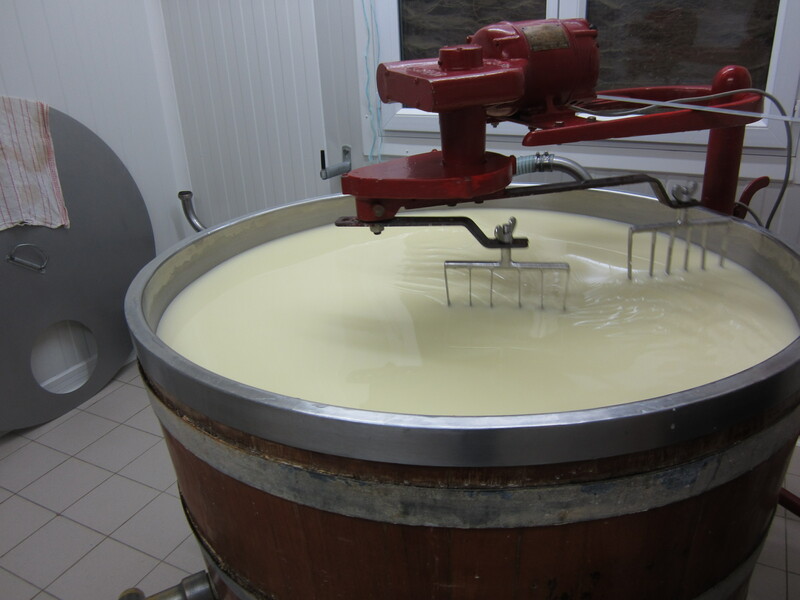 This separates the curds (les caillés) from the whey (le petit lait). Like the nursery rhyme! 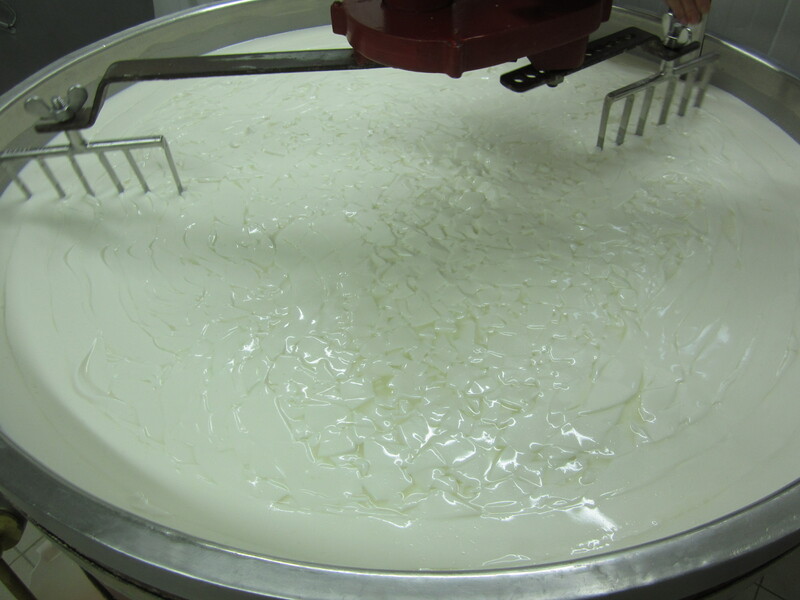 First the curds, which have a jello-like consistency, stay on the top surface and little designs from the blades appear. Gradually the whey comes out and it begins resembling a big pot of soup with chunks in it. 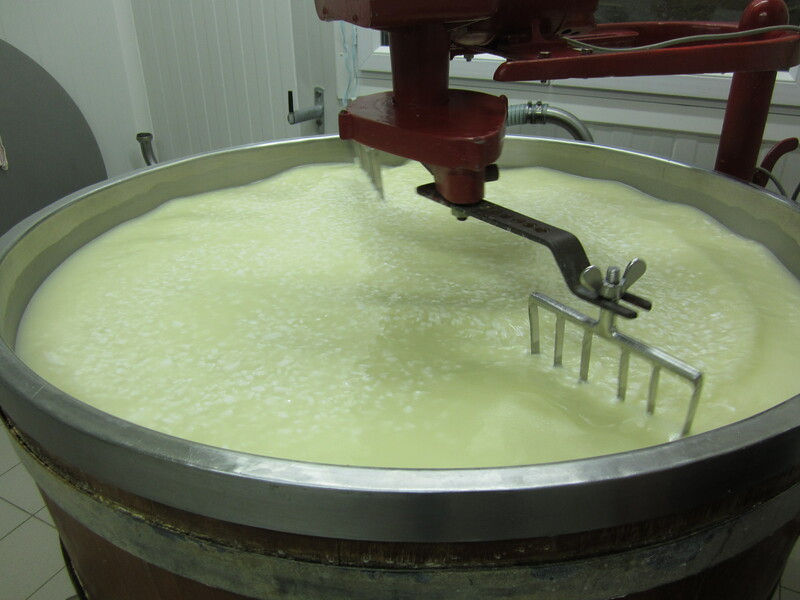 Then it looks entirely liquid as the curds become even tinier. This process takes about 30 minutes (hence Louise having to dash off at the correct moment). 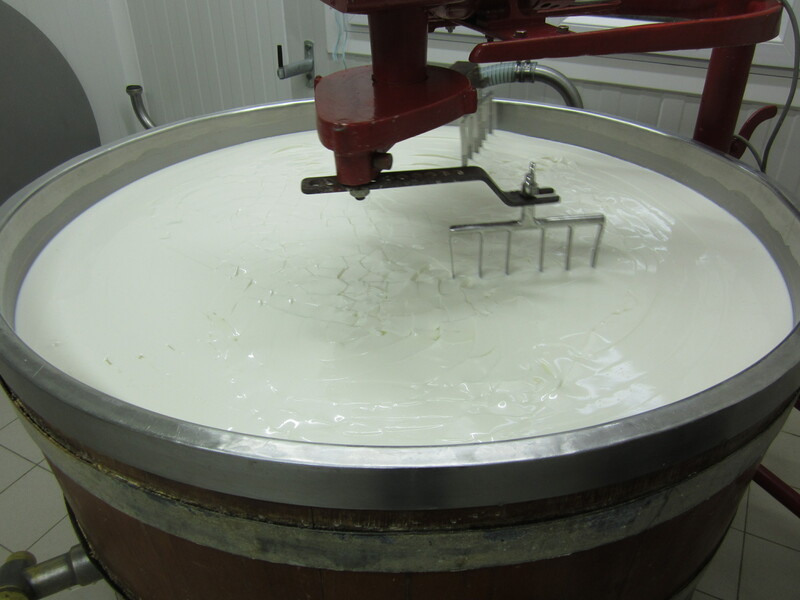 Can you see the lines in the curds? 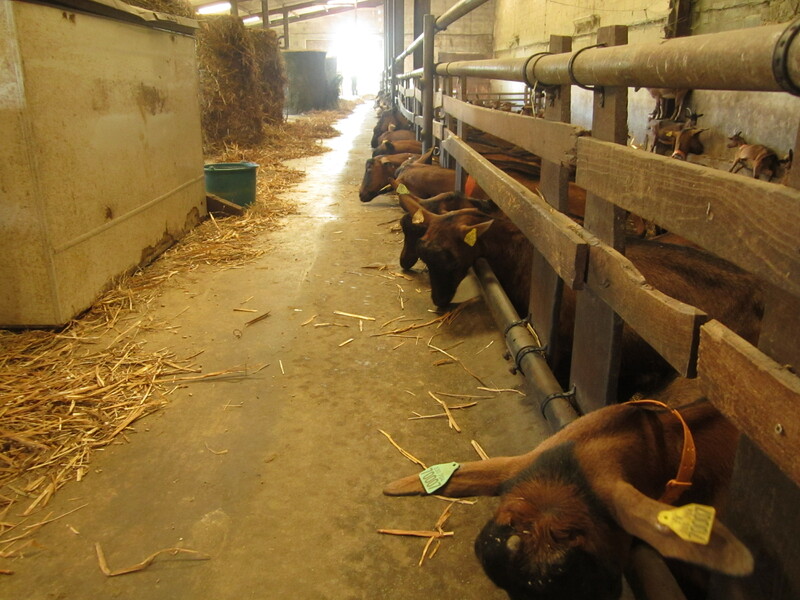 After they’ve been pressed on both sides, they are bathed in a salt solution for 24-48 hours, depending on the size. Then they are covered in some dirt-looking stuff (again, fabulous journalistic ability here) and left on racks in the cave to dry. The oldest ones she had were 1.5 years old! 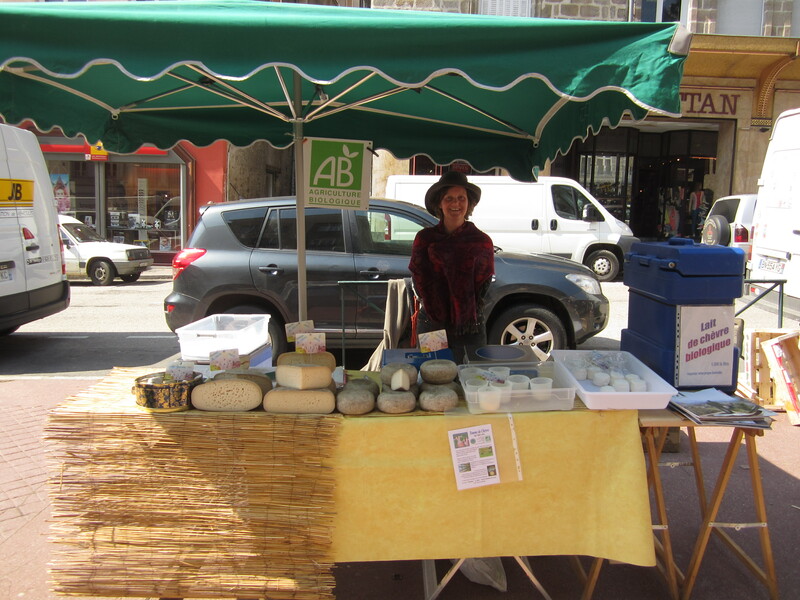 Two days a week, Louise or Maëva drive over to nearby Limoges to sell cheese and milk at the farmer’s market. One of the days I went with to help/see the town. It was fun to be on the seller’s side of the market for a change. It was a simple process, but I was slightly intimidated vending products to French people. I relied on my cashier instincts from my high school job at Beauty Center and felt totally comfortable behind the table – who knew that job would ever have come in handy? 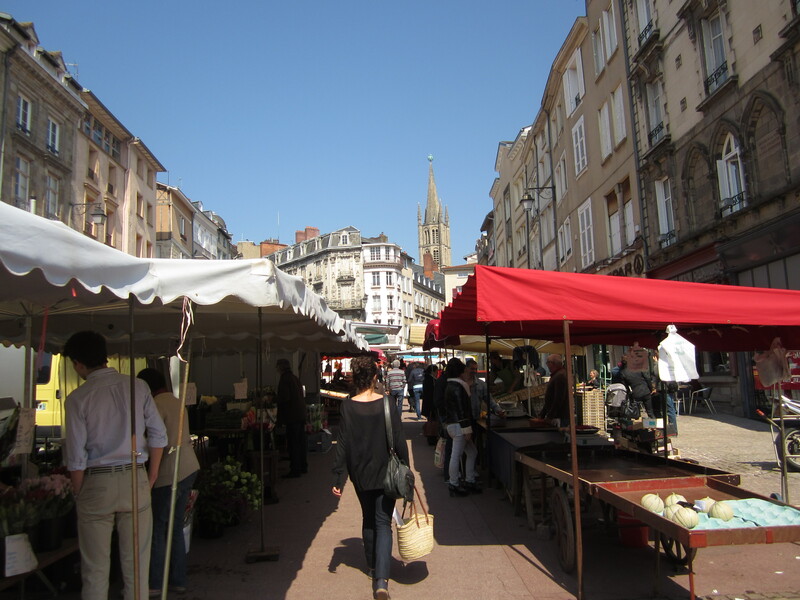 The other vendors at the market were very interested to meet an American girl and very curious to know what I am doing in France. A beekeeper “assigned” me this question to answer and gave me a few minutes to gather my thoughts: What is the difference between the US and France? I couldn’t decide whether I was more amused or more annoyed – it’s not that simple and I am just one person! But, I gave him an intelligent and thoughtful answer based on my own experiences. He listened, we discussed, and then he proclaimed my statements to be “student-level and undeveloped.” I was a bit perturbed by his dismissal of my ideas, but promptly changed my mind when he asked me if Miami was in California! I guess it’s not only Americans who are less-than-stellar in geography. In all seriousness, I don’t blame him because the US is a huge country and it’s not even his own. 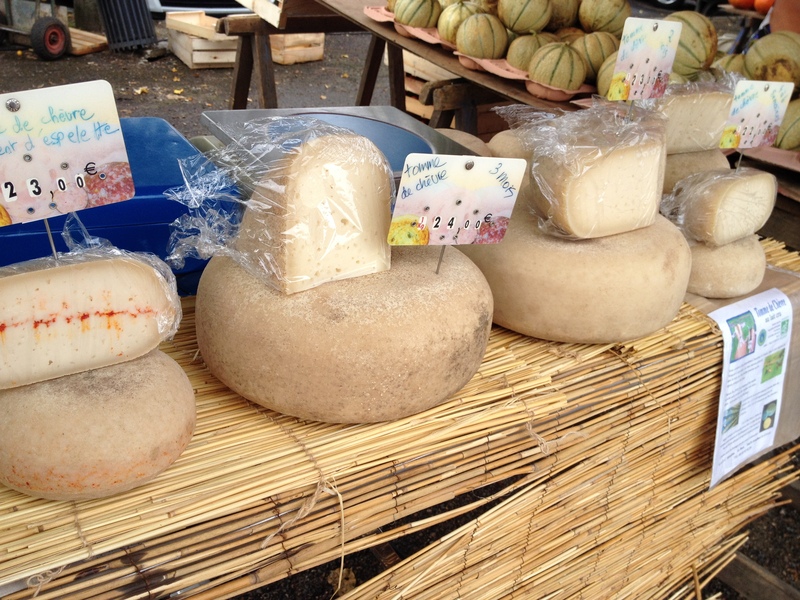 Anyways, it was so cool to see cheese being made, from goat to market (/my belly – the ladies gifted me with a HUGE bag of cheeses to take back to Paris with me). If you have the opportunity to do the same, I highly recommend it! 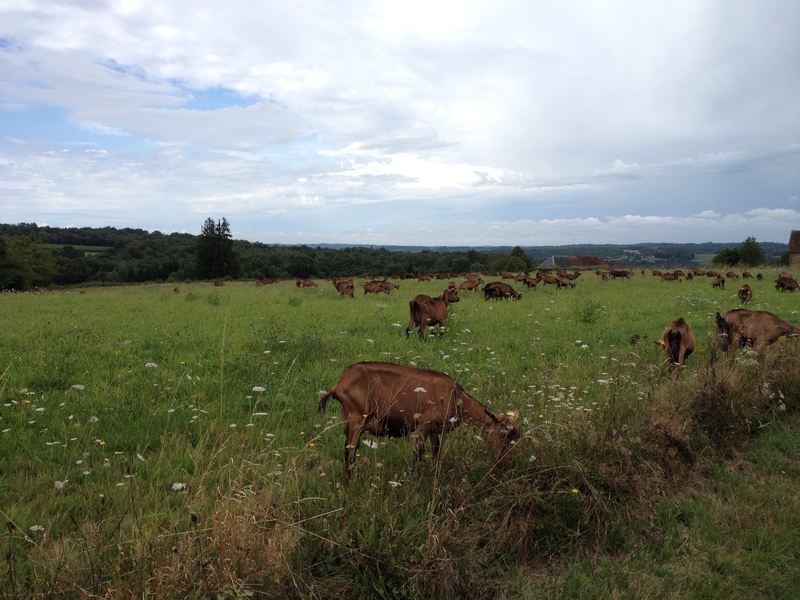 *Update: Click these links for my introductory wwoofing post and my posts about Le Jardinage, Les Chèvres, and my second trip there.